Those sweet waters of the Adirondacks. 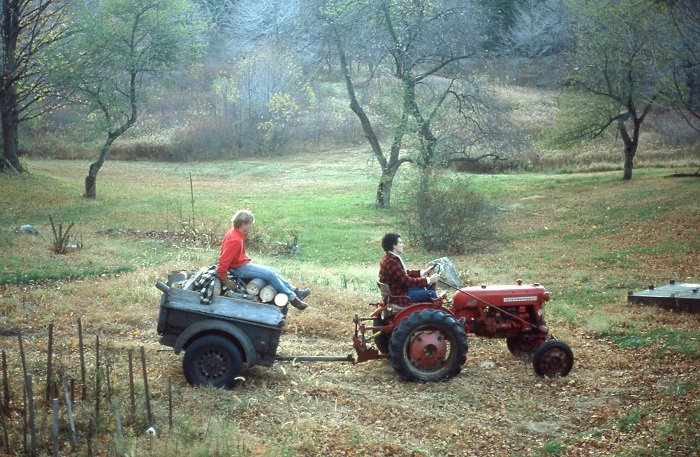 When I was young, my parents took us to upstate NY in the Adirondacks each summer for a two week vacation. 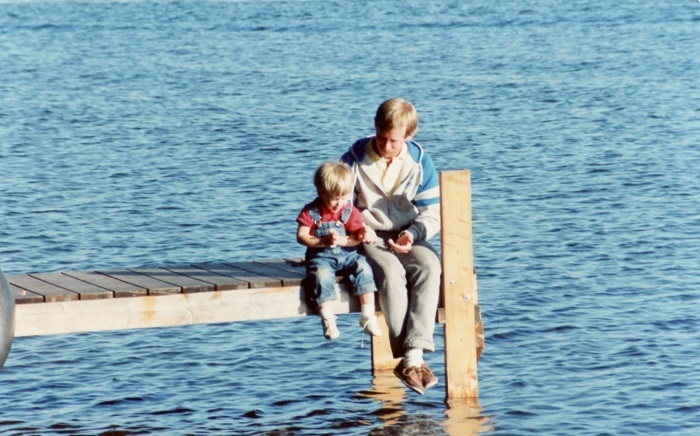 In all the years we visited, and it was for as many summers as I can remember, it was always to the same spot, Lake Clear, just north of Saranac Lake. 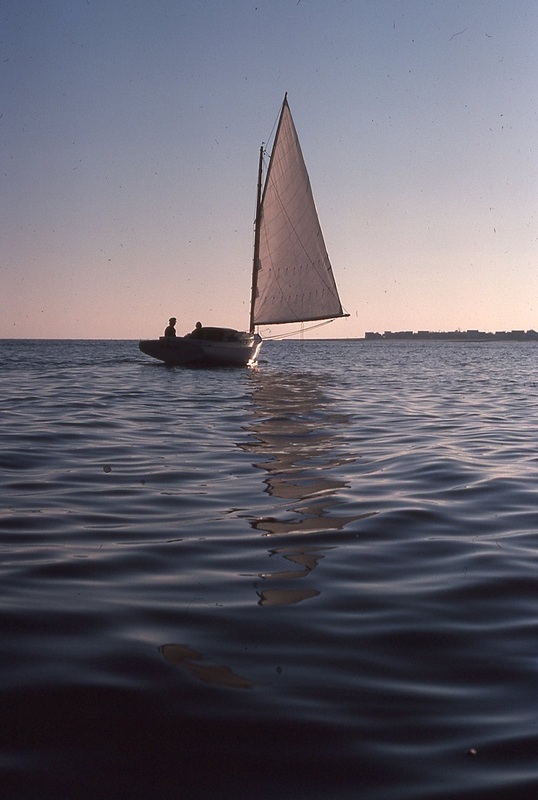 I have wonderful vivid memories of those summer breaks, fishing, sailing on an old Sunfish and time spent watersking for hours each day. 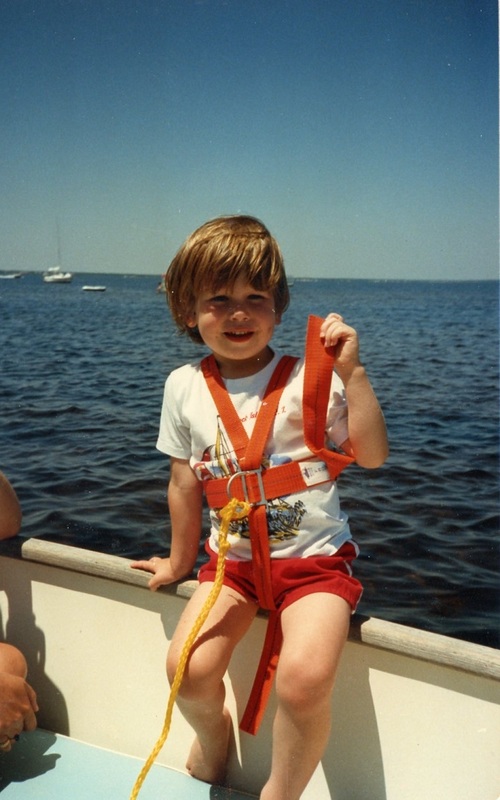 I also remember the daily trips to a local gas station with my dad to fill up the fuel tanks for the boat. Wow, but that boat, that we dubbed the “super pig” used gas. 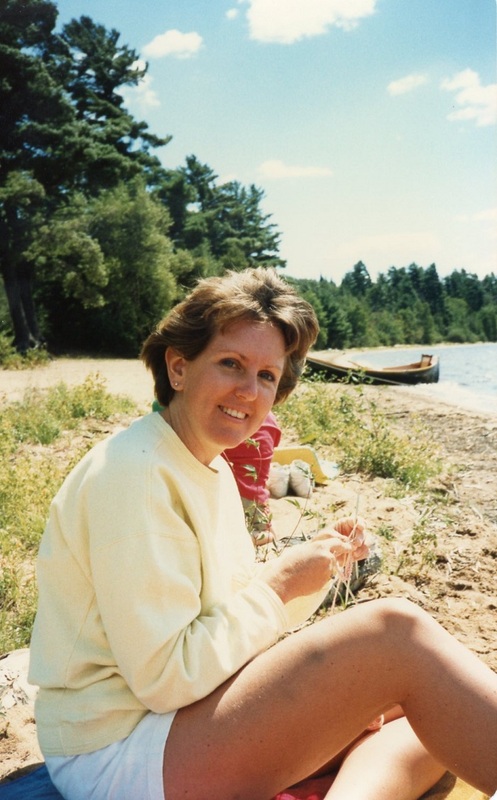 When Brenda and I were newly married, we too took our time at Lake Clear and even considered buying a cottage, balking at what seemed like an unfathomably high cost of $50,000 for lakefront property in the late 70s. 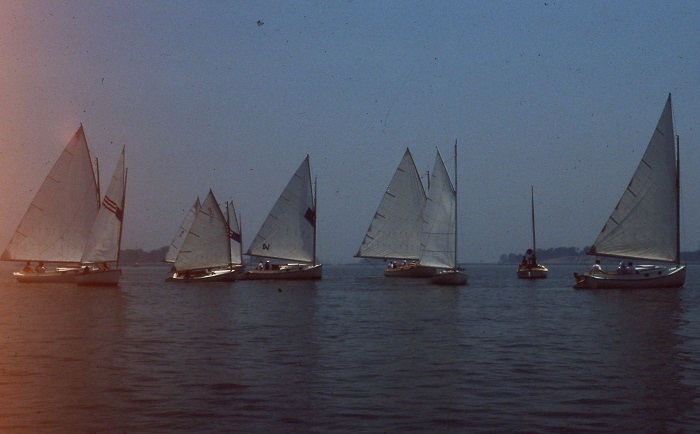 While we had not yet begun to focus on sailing, I felt a strong pull to the water. 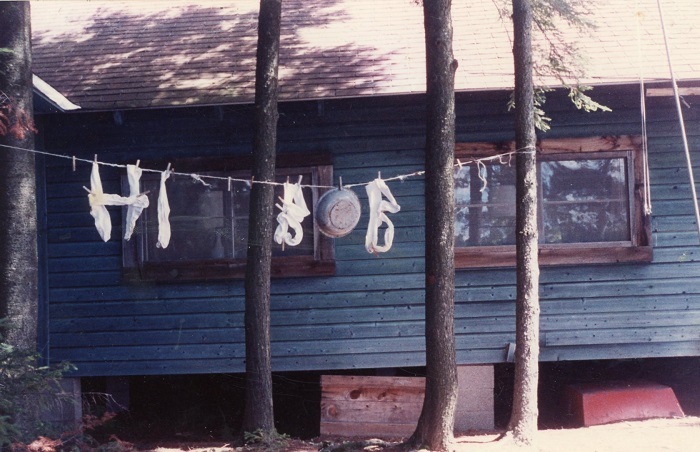 The cottage that we rented belonged to the Lathrops who were second generation owners of the property. The cottage was impossibly quaint if a bit rough around the edges. I seem to recall bringing our own vacuum to tidy up a bit when we arrived. During those years, Brenda played the guitar. Sadly, not these days but she has recently taken up the ukulele. Fingers crossed that she will catch that bug again. I fell in love with the traditional boats of the area. 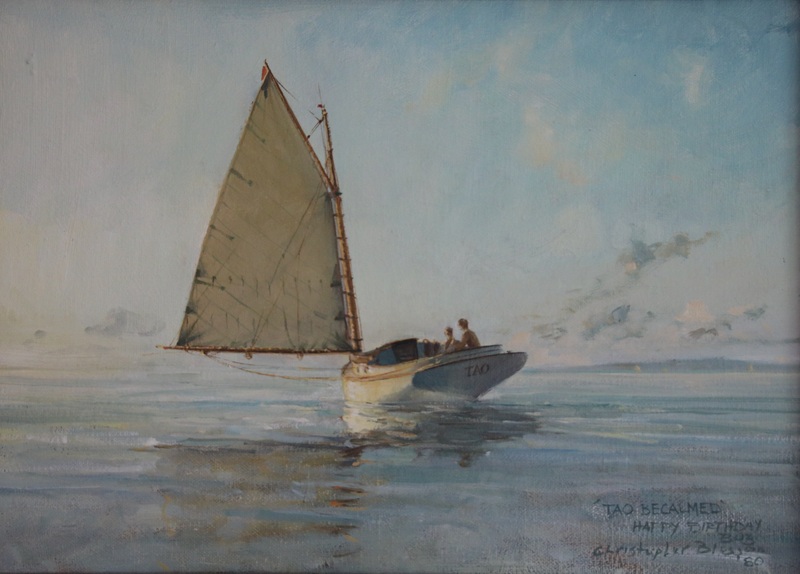 Perhaps the most iconic boat design of the region is the Guide Boat, so named because it was used for hunting and fishing by “sports” who visited the region by train from NYC to “rusticate”, beginning in the years after the close of the Civil War. 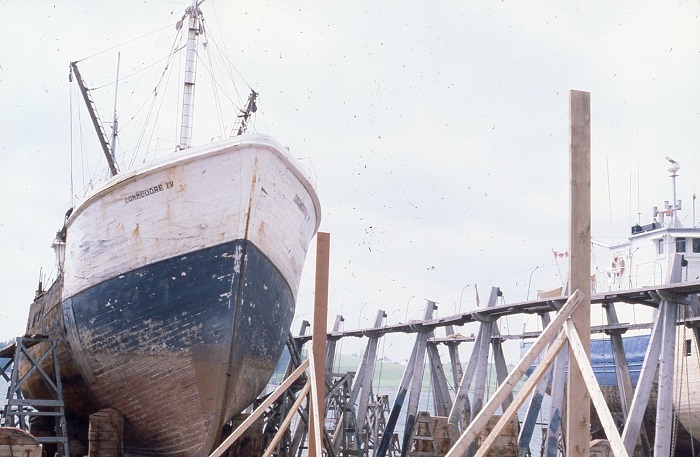 These boats were crewed by the builders themselves, who spent winters building the boats and summers taking visitors on guided hunting and fishing trips. 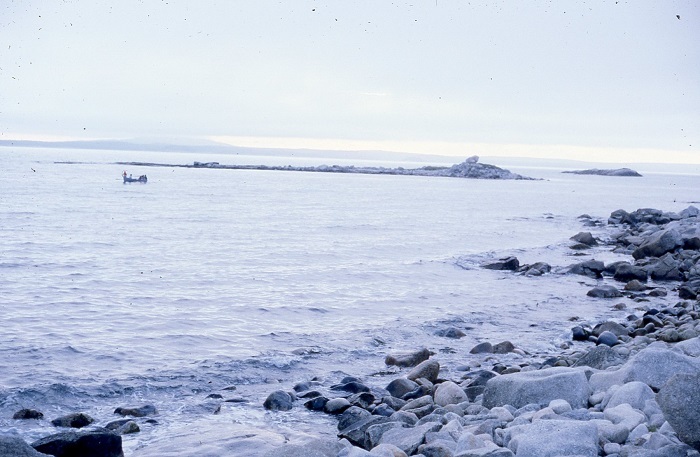 Guide boats are known for being easy to row and for being able to carry a lot of gear and as they had to as often it was a hunter, guide and any game that they may have bagged. 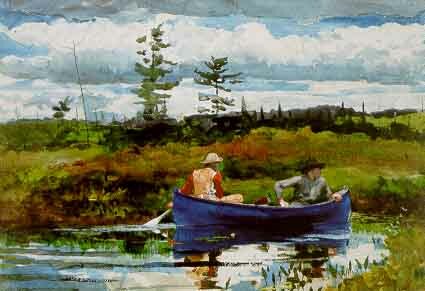 Windslow Homer spent time in the area too and painted this iconic image of a guide and his “sport”. However, this may not actually be a guideboat but you get the general idea. I got the bug to have one of these beautiful boats but couldn’t afford to buy a “real” one. 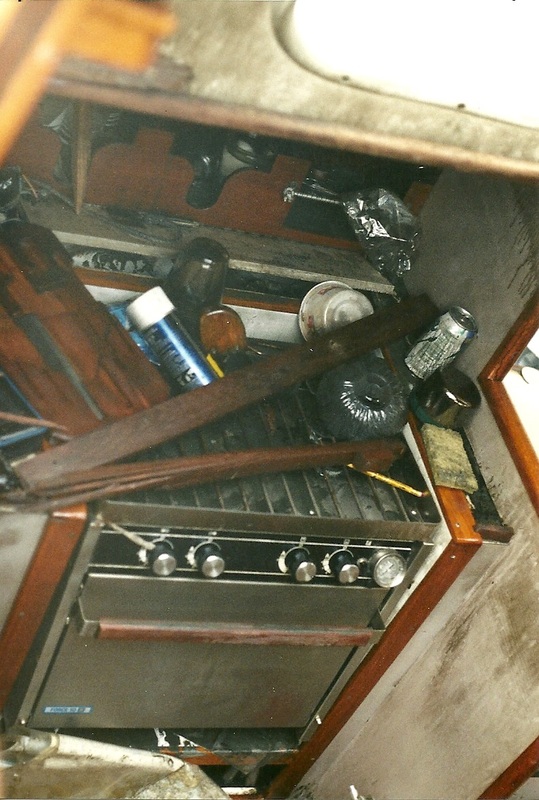 Instead, I found someone who was offering a “bare hull” in Kevlar which I finished with walnut decks and cane seats. I even carved out oars to pretty exact specs. This is one sweet boat to row and very light. The hull and fitting design were taken off of the lines of a particular boat “Ghost”, built by H.D Grant. 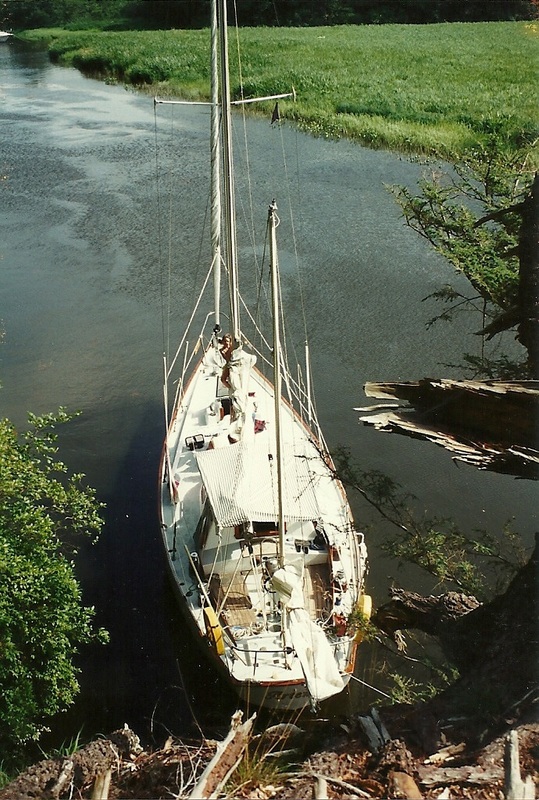 The original boat is now in the collection of the Adirondack Museum, renamed the Adirondack Experience. 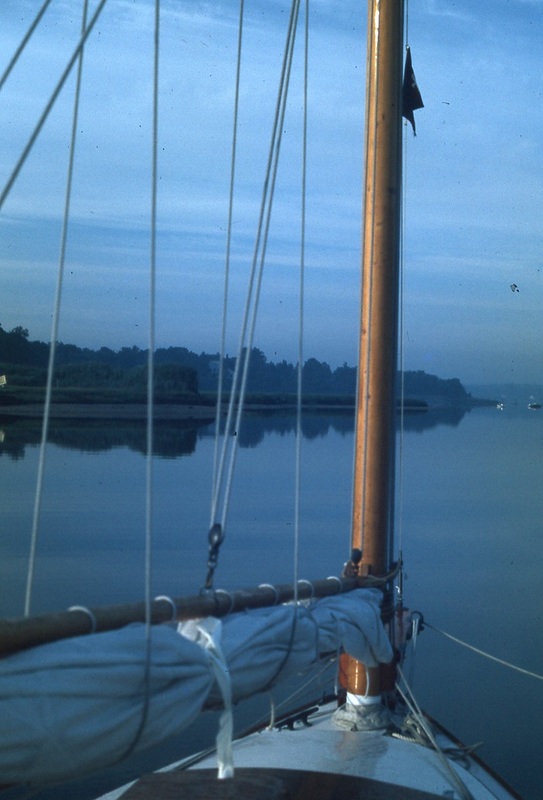 Plans for the boat, which I purchased from the museum, are now available from, oddly, Mystic Seaport. 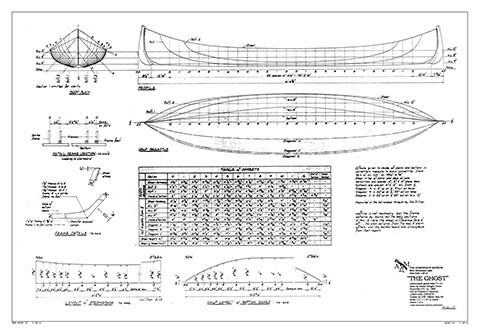 The 16′ boat has beautiful lines and with her 8′ overlapping oars, is a dream to row. It is said that a traditional guide boat is the fastest rowing boat you can find without a sliding seat. The boat Ghost itself and museum are located on Blue Mountain Lake. It’s a really great place to visit and has examples of many boats that plied the waters of the many lakes that dot the area. 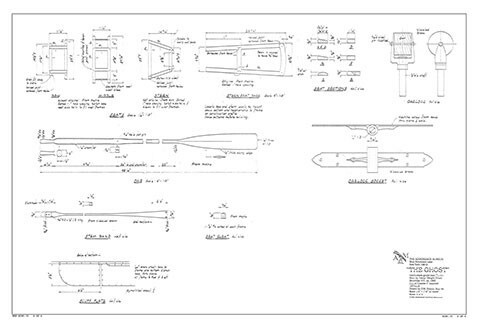 Here’s are some of the sheets of the plans that I purchased. The plans even specify details down to the oarlocks which I was able to purchase from a foundry that had duplicated the design to be true to the original. 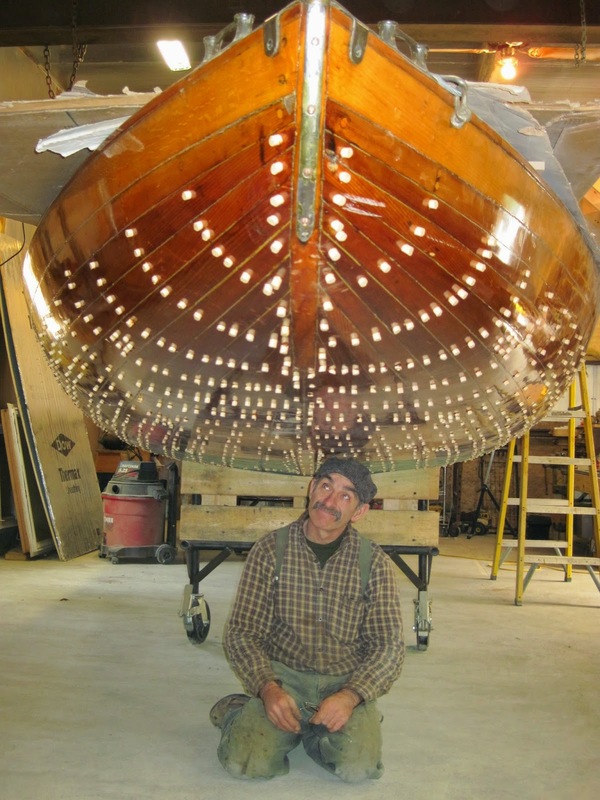 This design of boats has been remarkably popular for over 100 years and there are still boats being constructed using the exact same techniques and materials. 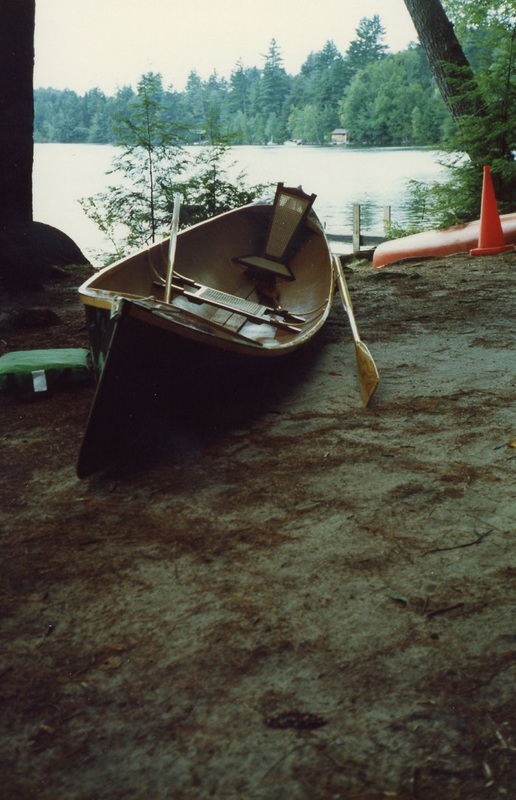 These boats are very tough to make as the materials are impossibly thin to keep the weight of the boats to a minimum given the need to portage, or hand carry, from one lake to the next. 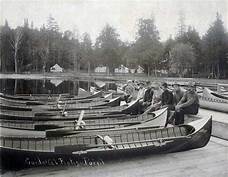 There were many hotels dotting the lakes that featured guideboats for hire, complete with guides. 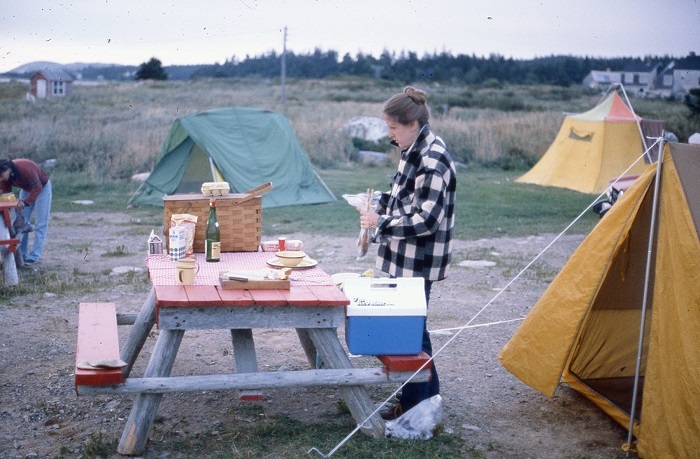 We had many wonderful times heading out on picnics on the lake and nearby St Regis Lake. Wow, what a dish. Nice boat too. 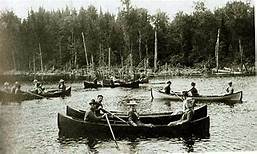 St Regis Lake was and is still today, home to many of the “Great Camps” where wealthy city dwellers would spend time “rusticating” in somewhat less than rustic conditions. One of the most famous is the camp, Top Ridge, was built by Marjorie Merriweather Post, which she called a “rustic retreat”. 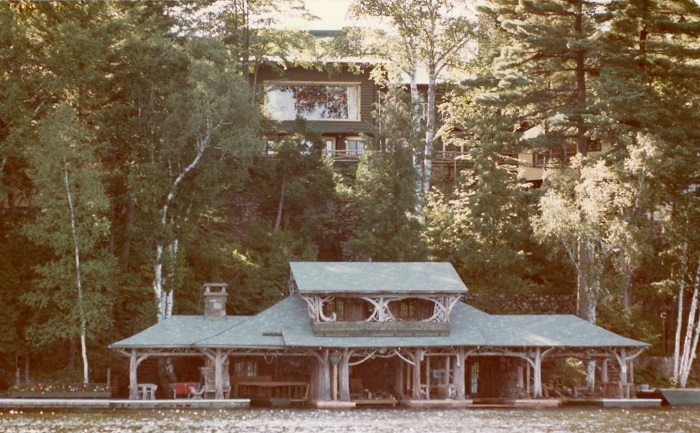 While the lake is home to many “camps”, hers was the most lavish, featuring nearly 70 buildings, including a Russian dacha. 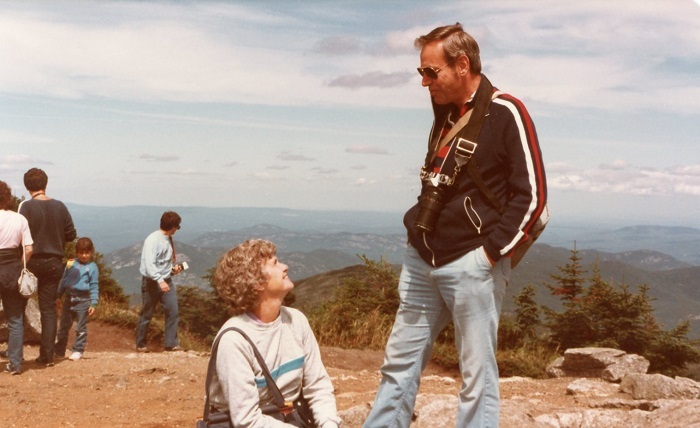 She collected Russian art and her connection to the country was her third husband that served as the ambassador to the Soviet Union for a time. I can still vividly recall seeing a plane at the nearby Adirondack Airport that my dad, an airplane buff, told me was hers as she still used the camp for vacationing and lavish entertaining when my family visited Lake Clear in the early years. This is a photo of what was probably the plane I saw so many years ago as it’s the one that she used traveled in when she visited Top Ridge. 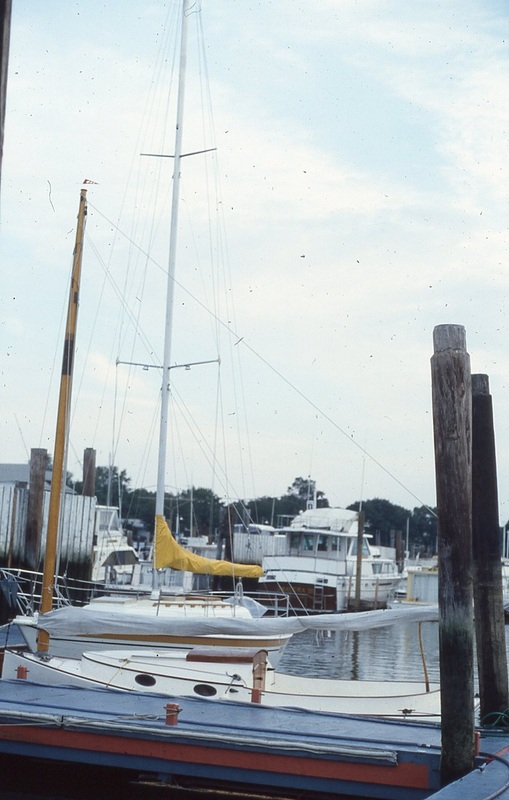 I’d guess that my father knew it was her plane because her name was right on the bow, “Merriweather.” While there was eventually there was a service road to the estate, during Post’s ownership all materials and visitors arrived by water, landing at this magnificent boathouse. The largest building for the estate, above the boathouse, featured what was, at the time, the largest piece of plate glass in the area, offering a beautiful view of the lake. 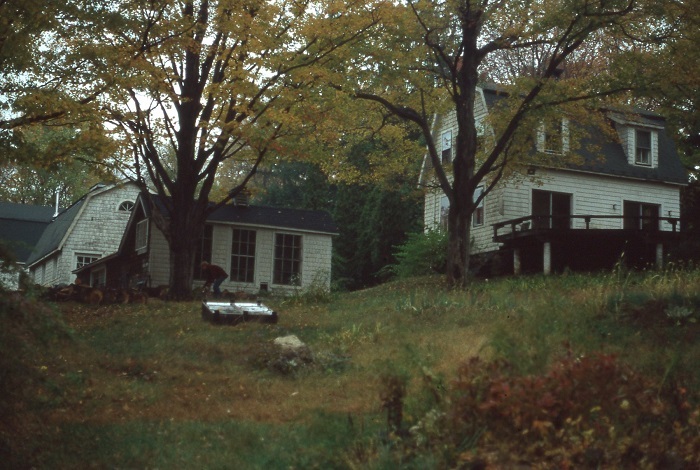 Following her death in 1973, she willed the compound to NY State that used it as a retreat for a number of years. During that period it was open to the public so Brenda and I visited. The state eventually sold the property to the flamboyant Roger Jakubowski, who had made millions selling hotdogs in the NY City area. This article in Adirondack Life gives some interesting information about him, the property and it’s furnishings. 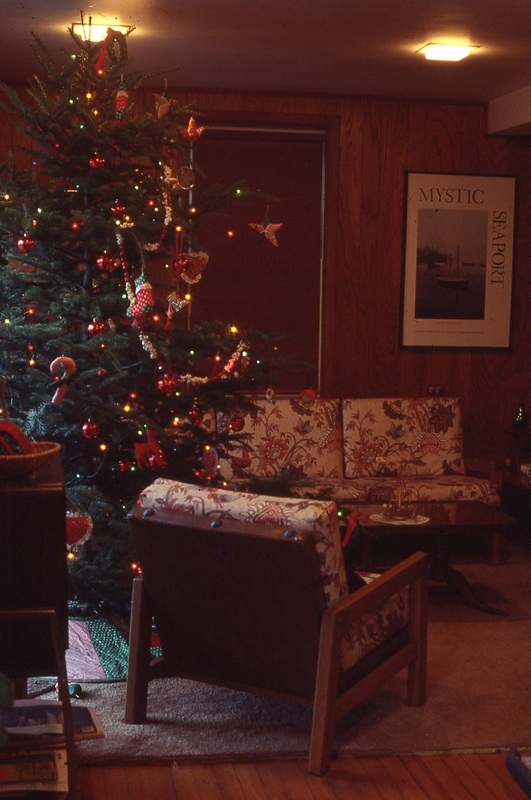 When we visited the estate, prior to his ownership, the main cabin was open for visitors and I recall many of the furnishings mentioned in the article. 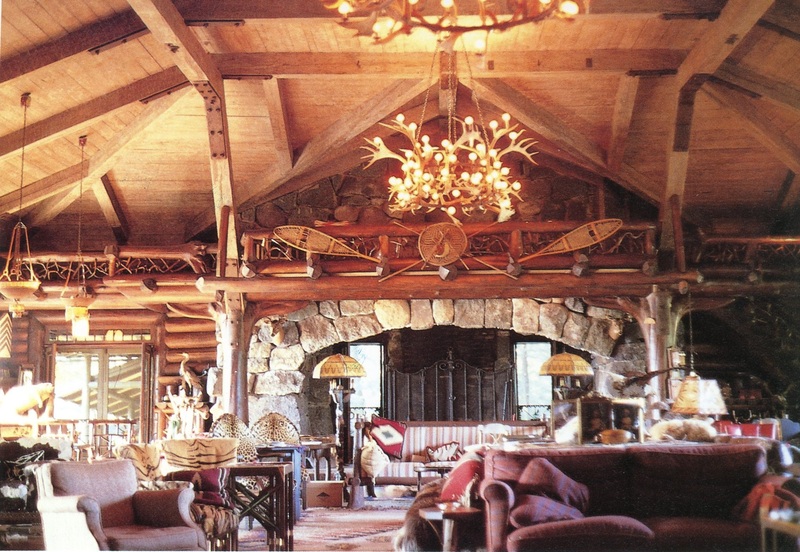 This photo of the great room in the main building, is out of a wonderful book, Great Camps of the Adirondacks, that chronicles the history of these remarkable “camps”, er, estates. It’s no longer in print but used copies are available at a very reasonable price on Amazon. 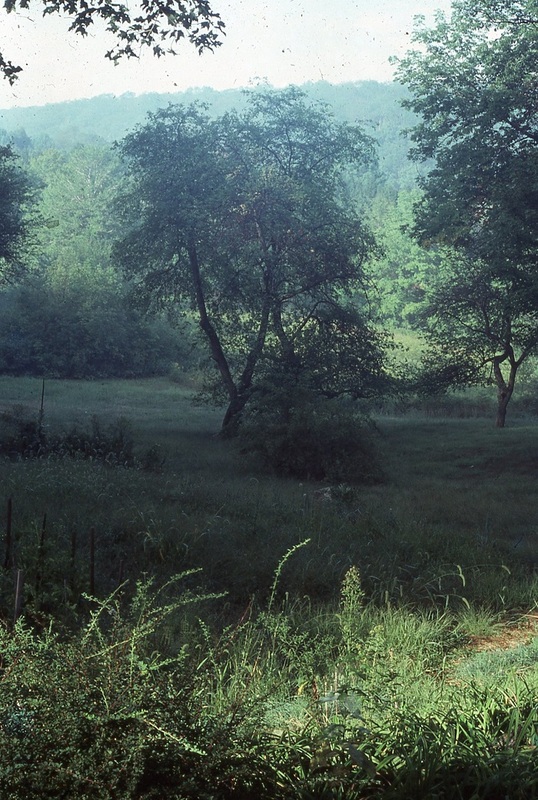 Anyway, the estate is now owned by Hartlan Crow, a developer from Texas, who has substantially restored the camp. Marjorie wealth was as a result of being the owner of General Foods and she was for a long time, the wealthiest women in the country. She became wealthy the old fashioned way, at the tender age of 27 she inherited the Postum Cereal Company, the predecessor to the company we’ve all heard of today. 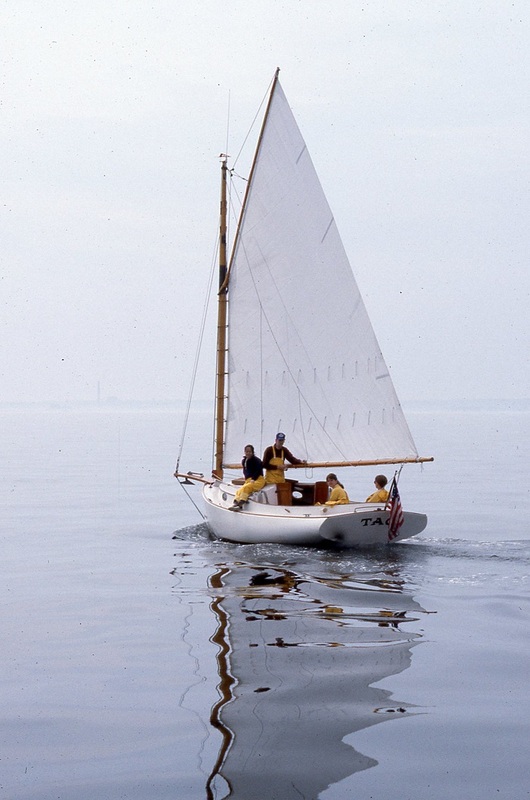 The lake is also the home of a class of a very unique gaff rigged sloops, the Idem class. 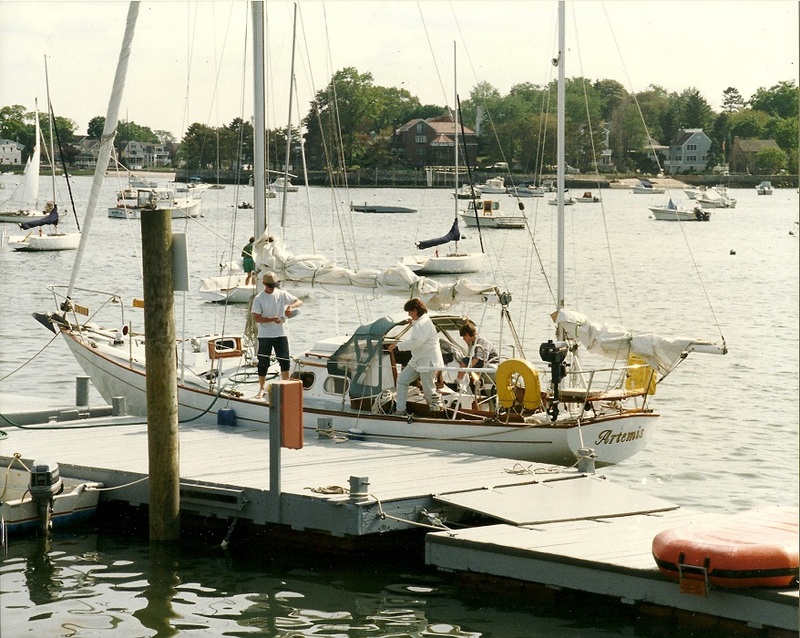 Originally designed for the St Regis Yacht Club in 1899, the fleet consisted of a dozen boats. 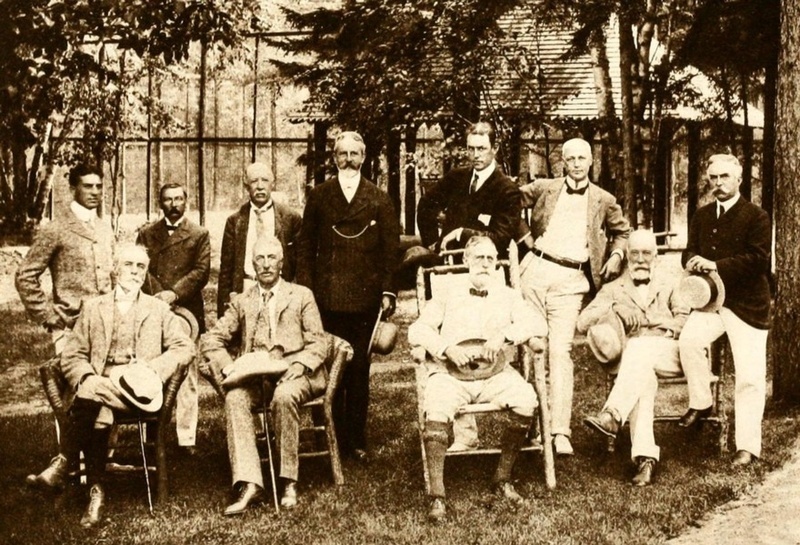 How about this for a serious looking group of owners? Here’s a shot of them racing in 1900. 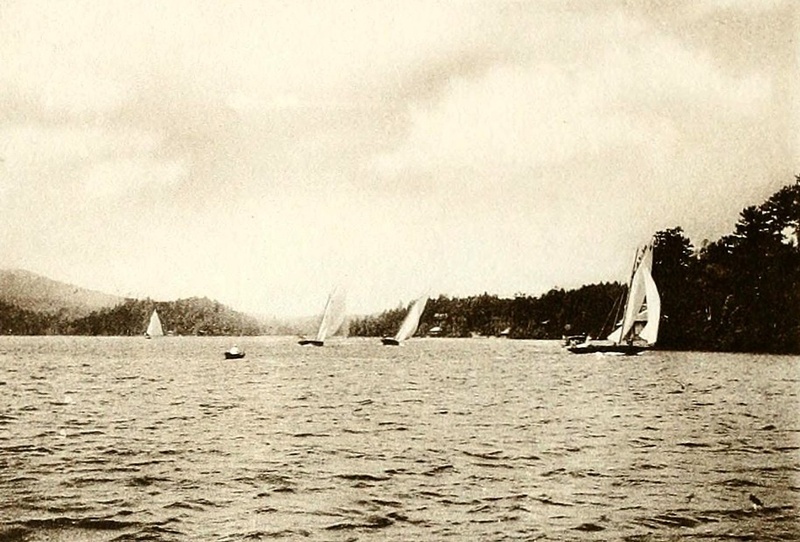 Those same boats racing 100 years later. This is one we saw when Brenda and I visited the lake in our guideboat. 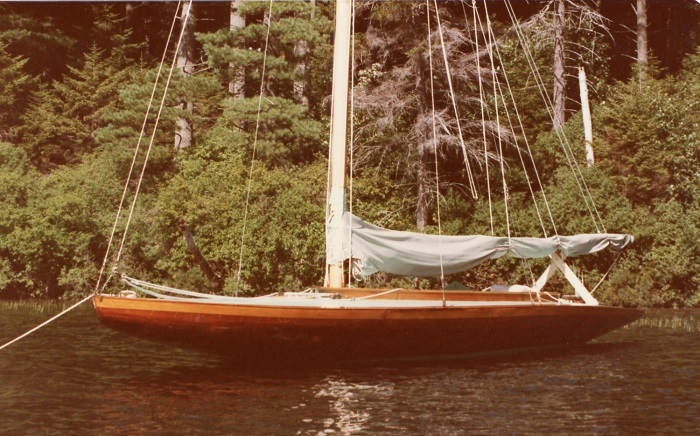 One of the original dozen that were built is now on display in the Adirondack Museum with all of the others lovingly maintained and still kept on the lake. In 2004 a new boat was built to the class so that now, once again, there are a dozen boats on the lake that race together. As you can imagine, a great deal of work and care goes into keeping these boats in top shape more than 100 years after they were launched. There is one shop in particular, Nik and Sons, that specializes in keeping these beauties on the water. 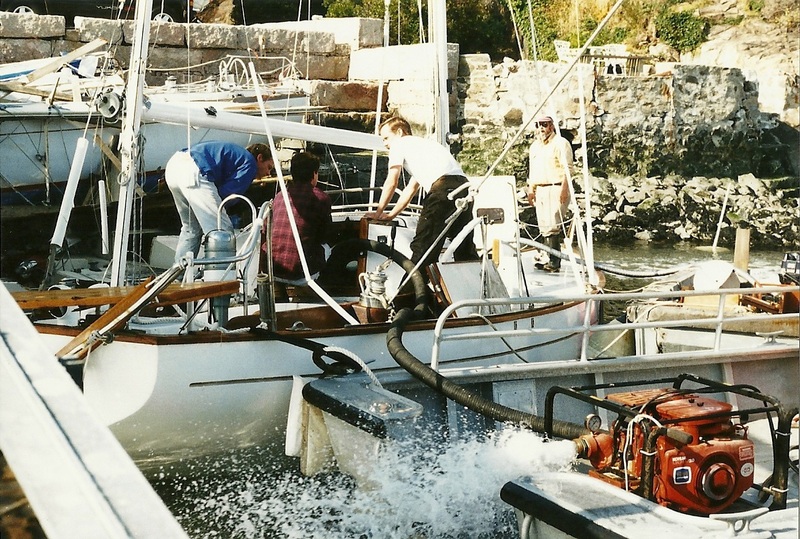 Here’s a shot of Idem Elfmere getting all new fastenings, 3000 in all. 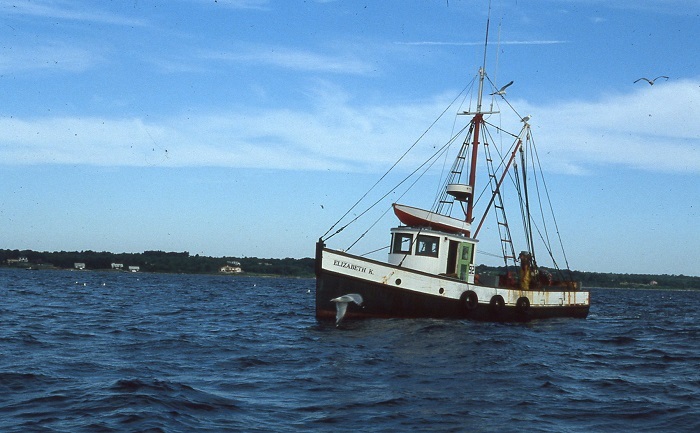 When Post married for the second time, it was to E.F. Hutton and subsequently she and Hutton were the owners of Sea Cloud, built in Germany and launched in 1931. 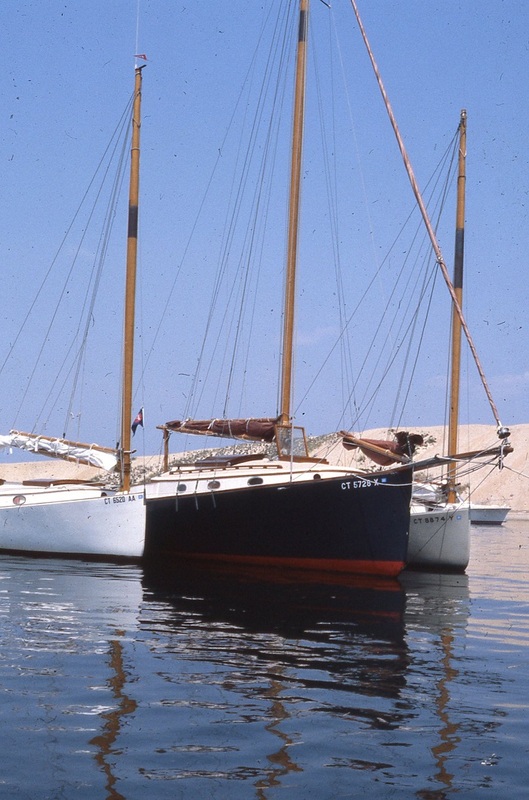 When launched she was the largest privately owned yacht in the world. 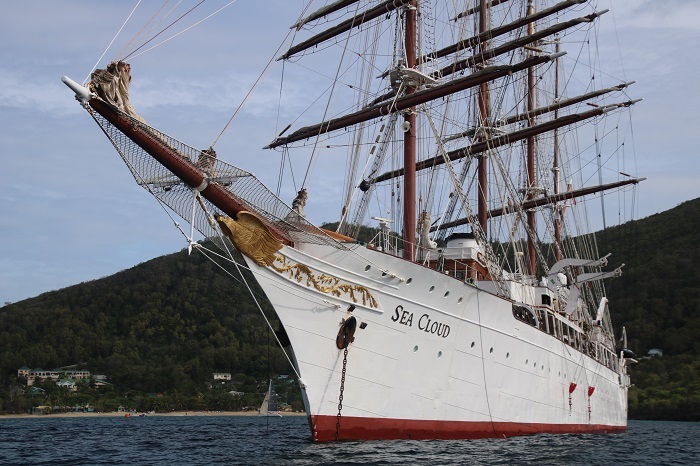 We spied Sea Cloud in Bequia last winter, now a boutique cruise ship, having many lives since being sold by Post in 1955, Post was also the builder and first owner of Mar-a-Lago, now owned by our current president, Trump, if somehow you missed his tweet reminding you. Anyway, back to Lake Clear. 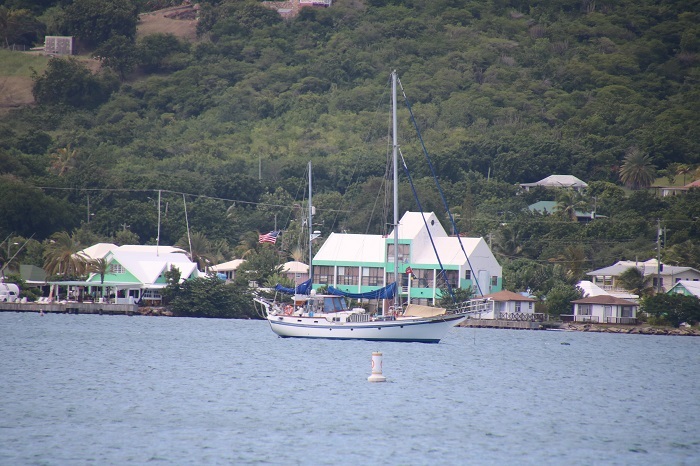 We took our guideboat up to St Regis and passed Topridge but by that time it was in private hands. 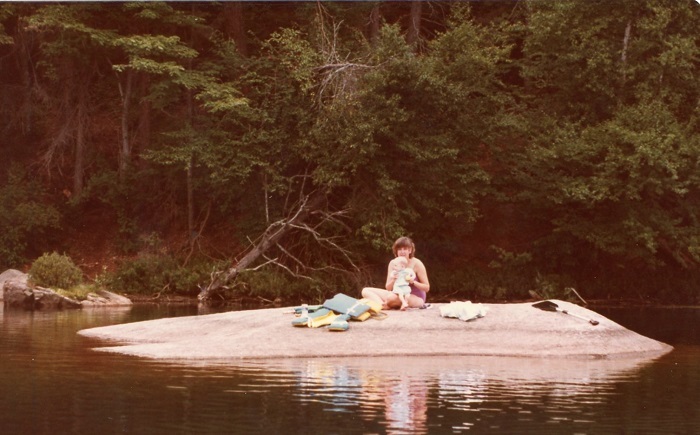 We portaged to nearby ponds and often stopped for a break at this spot, a huge rock just breaking the surface of Bear Pond. This shot must have been from when we only had little Rob. I recall that the water had a strange blue-green color and was impossibly clear. 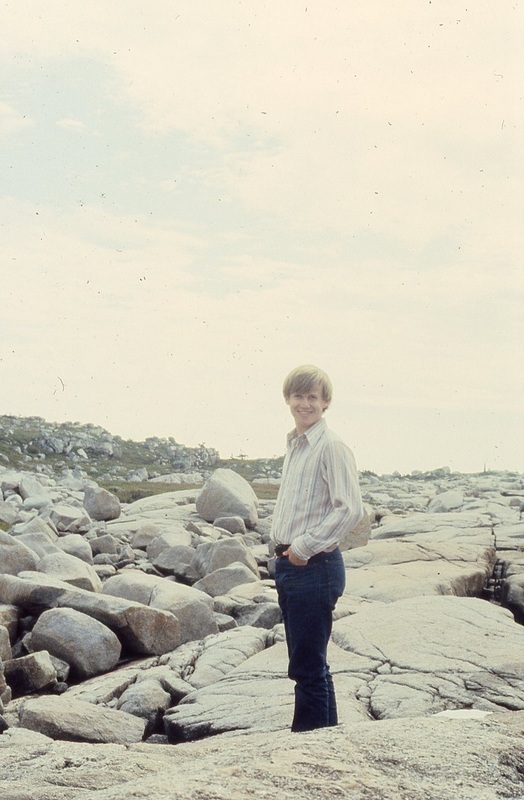 Anyway, visiting Lake Clear was a big part of my early years as well as when Brenda and I were newly married. We spent many hours around the proverbial campfire at the Lathrop’s cabin nearby, first with just Rob and then Chris too. The four of us went on outings in the Guideboat. And sat on the dock. 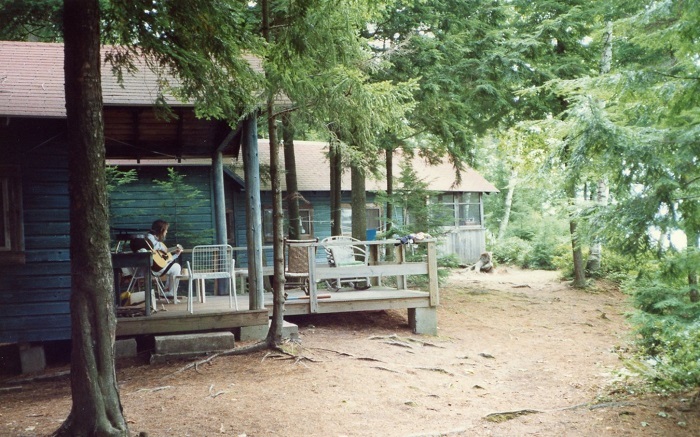 In our early years together, we rented a cabin with my parents. This is them on the top of Whiteface mountain. My mom is now nearly 90 and my dad’s been gone for about 5 years. He was a great guy and I think about him every day and still miss him terribly. Personally, I think he should have been given more time for “good behavior”. Not sure what this was all about but there were lots of shenanigans while the Osborn clan was visiting. 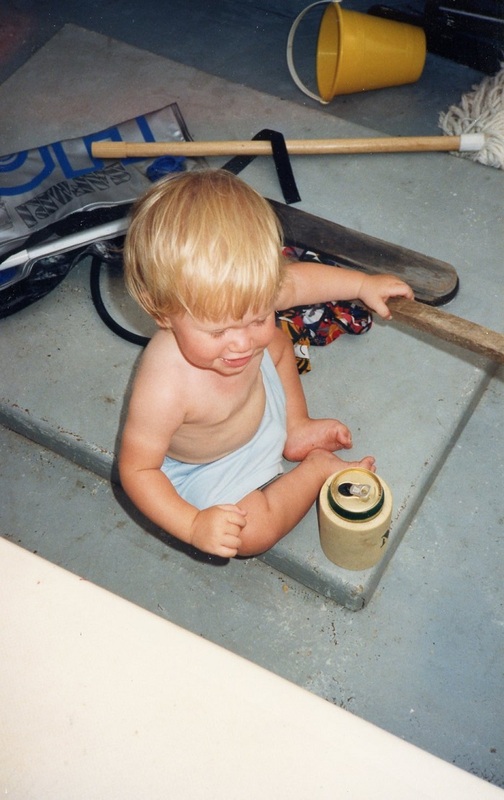 These days I am still very much a boat lover and spend as much time afloat as I can but then you already know that. 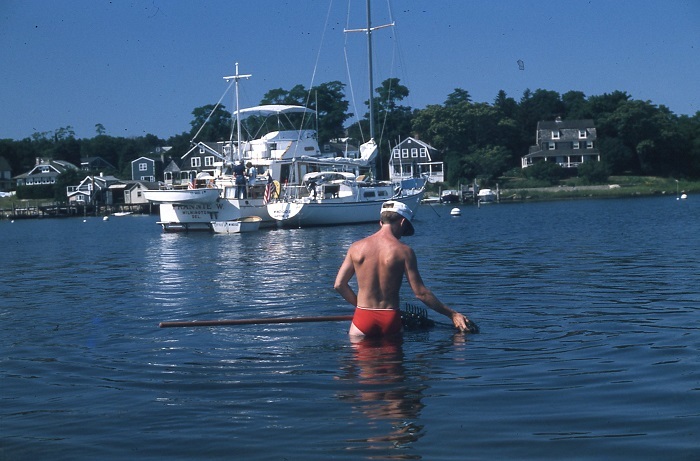 Today we spend more of our time on salt water with the sweet kind which is limited to our time on the CT River near our home. 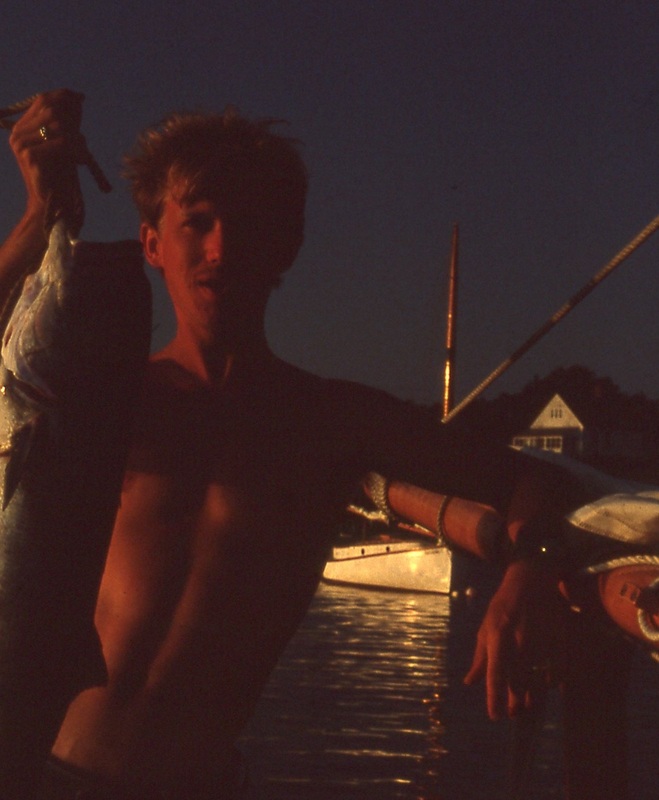 However, is was those early days spending time on the sweet waters of the lakes of the Adirondacks and Lake Clear that ingrained, in me, a love of being on the water. I sometimes wonder what life would have been like if Brenda and I had taken the plunge and purchased a camp. While it would surely not have been a “great camp” it would have been terrific, never the less, all those years ago. Who knows. But, either way, it’s worked out pretty well. Sweet, I’d say. Yes, very sweet. The boys on the boat. Is that safe? As I have mentioned, Pandora is on the hard and me landlocked in freezing New England for the winter. 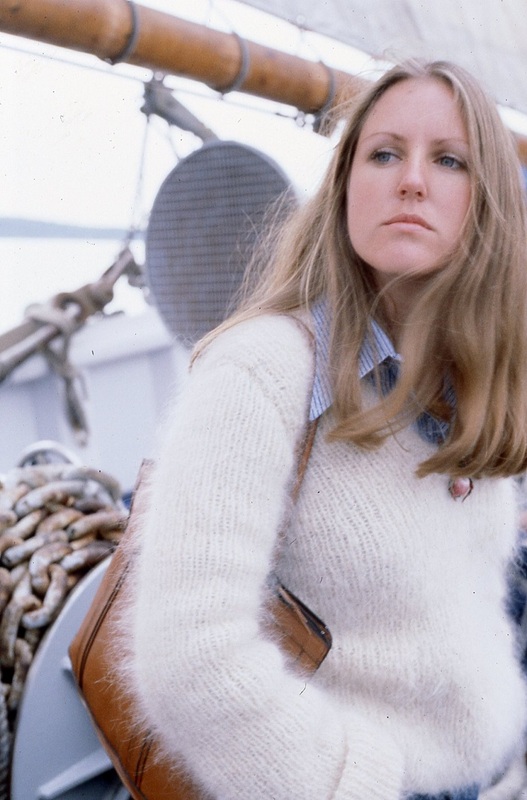 As a result of my “incarceration on the hard” I have also found myself thinking about “summers of old” and the sailing that Brenda and I did together and then later, with the boys, Rob and Chris who arrived on the scene, in that order. 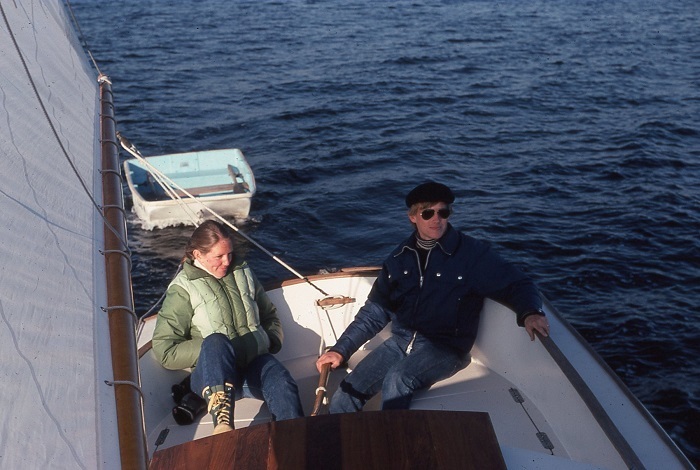 From the time that Brenda and I married in 1977, you can do the math, but it’s been a good long while, we have had a boat, beginning two years after we married and with only a single year break when our second, Christopher was born. 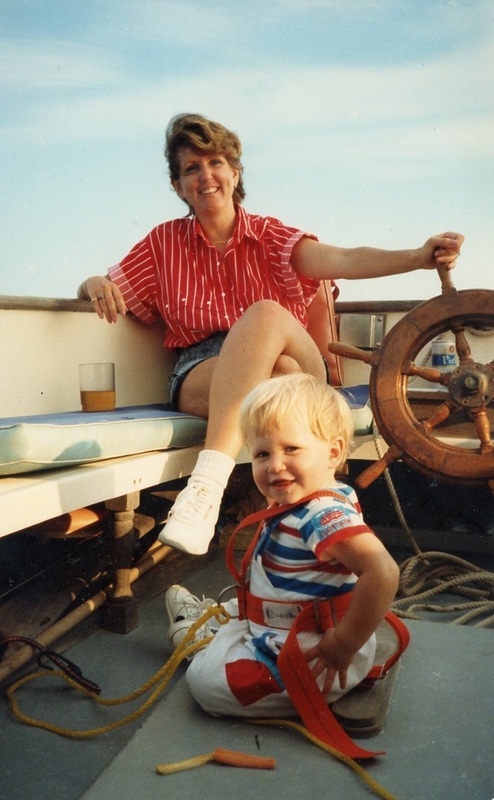 Boating has been a big part of our lives together. 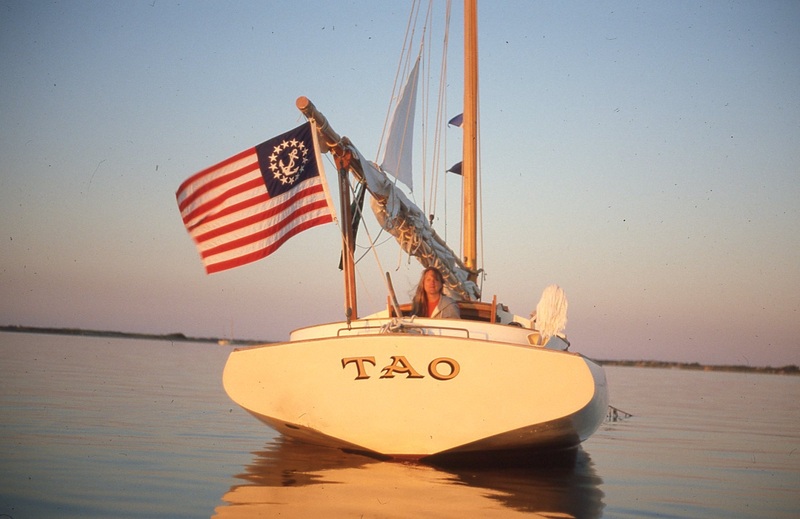 Recently I wrote about the purchases of Tao, our first boat, in the late 70s and since that post, I uncovered this lovely shot of her. Chris and Pat were aboard for that particular run. Those were the “pre-child” years and we had a lot of fun. 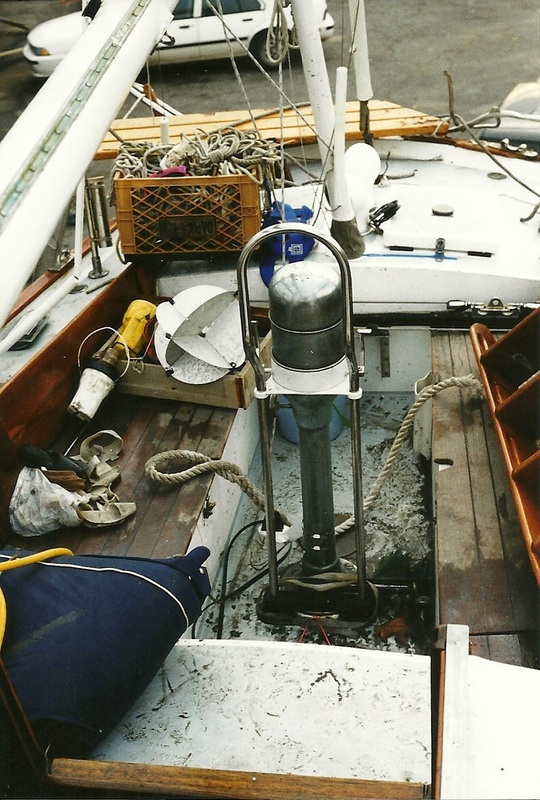 Anyway, we were anchored off of Norwalk CT on Long Island Sound and somehow, after a cup or more, perhaps a lot more, of sake, we somehow managed to drop the sake-heating pan overboard. 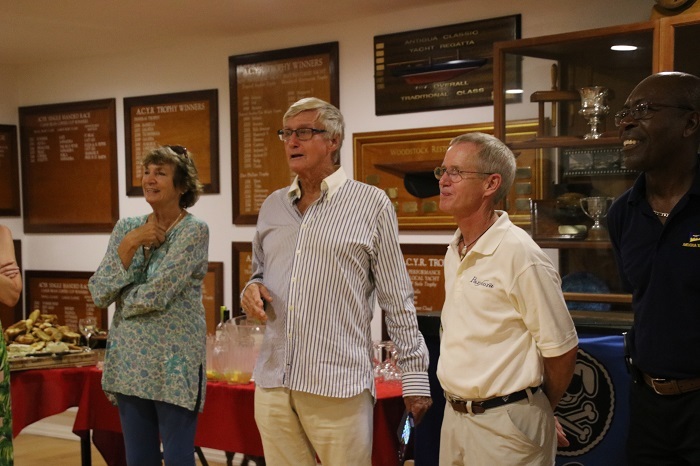 “So, Bob, were you able to get the pot back?” Actually, I did as somehow I had the presence of mind, in the “heat of the moment”, get it, the pot we “heated” the sake in?, to drop a “lead line” over the stern with a float, to mark the spot. Lead line you ask? For those of you that aren’t “of a certain age”, it’s a lead weight of several pounds that is attached to a piece of line with knots every 6′, or fathom, that is tossed overboard to determine the depth. Of course, you have to hold the bitter end. However, nobody carries one of those these days with the advent of electronic depth finders. Anyway, the next morning I went for a swim to retrieve the pot and probably to clear my sake muddled head. 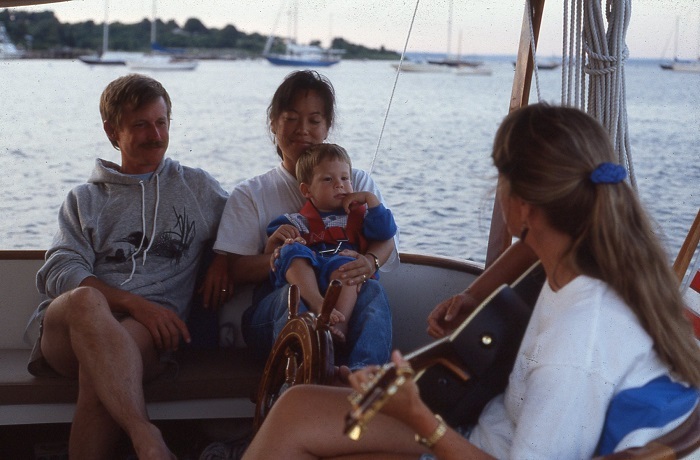 Over the years we spent many days and nights with Chris and Pat and once they purchased their own boat, a lovely little 23′ Seasprite and we rafted up nearly every weekend. 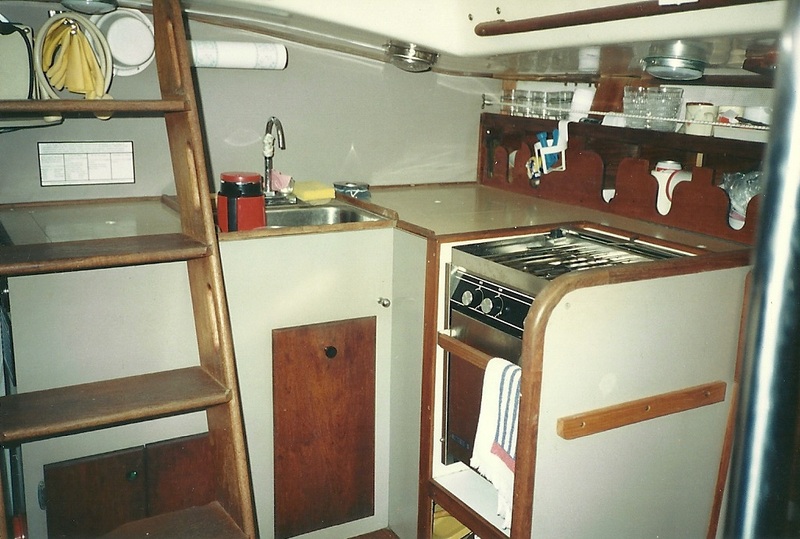 Of course, by that point we had sold Tao and moved up as well, if going from 20′ to 22′ was really “up”, to our Marshall 22 Sappho. 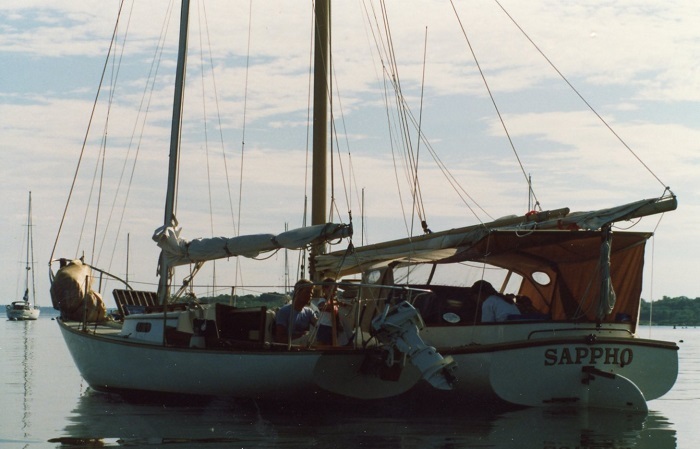 We had many fun weekends aboard and some still involved sake. So, after perhaps one too many nights afloat, perhaps with more sake, somehow Brenda began to change shape, especially in one particular spot. How’d that happen? Suddenly, we had babies on board. 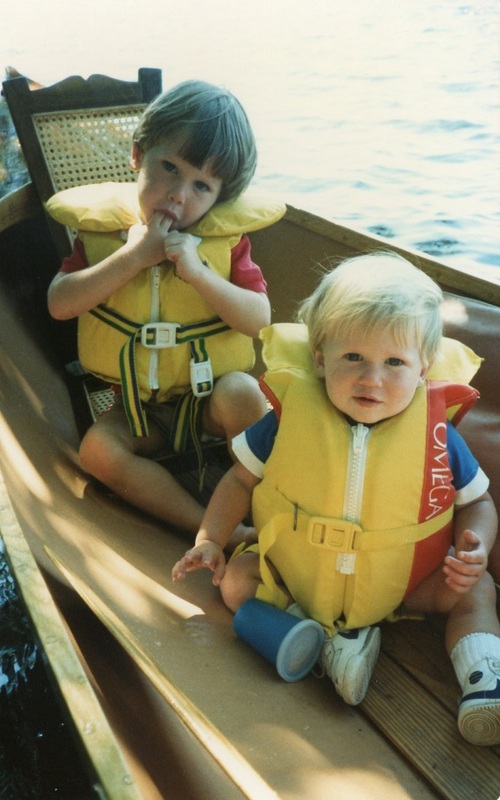 Both Rob and Chris were aboard by 3 months old, 25 months apart, of course. Go ahead Chris, have a sip of beer, it will take the edge off of those skeeter bites. Boating aside, we still vacationed up in the Adirondacks for a number of years before chucking that for more time aboard. Yes, I know that this doesn’t really fit in the post but it’s such a great shot, I had to use it. Over the years, the boys got bigger. And bigger still. And then even a bit bigger. We fed ducks. Isn’t that what all kids do? And always with the most nutritious white Wonder Bread, of course. 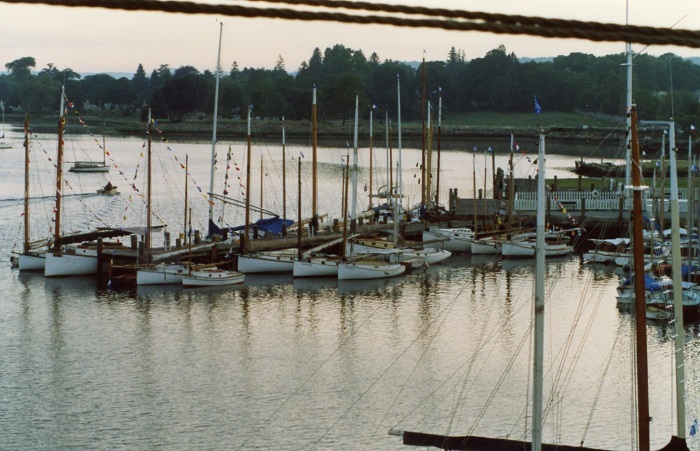 Along the way we joined in on a big celebration of The Catboat Association at Mystic Seaport. 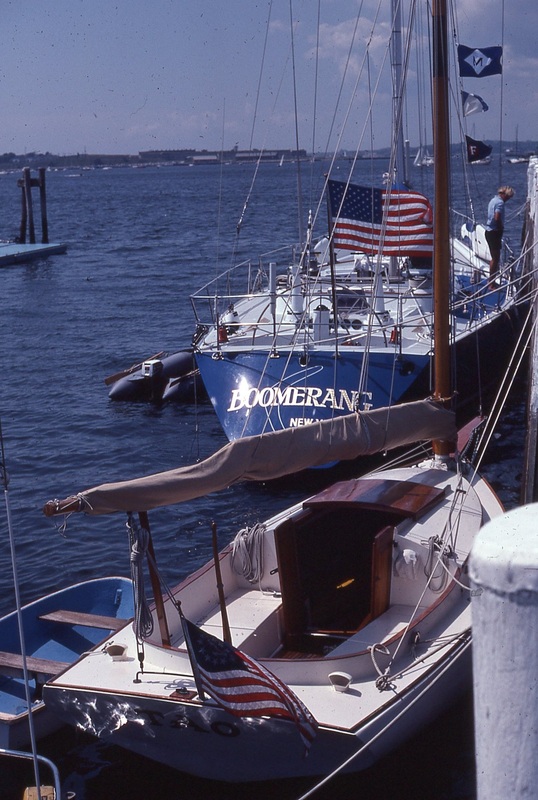 There were many catboats, a lot of catboats. 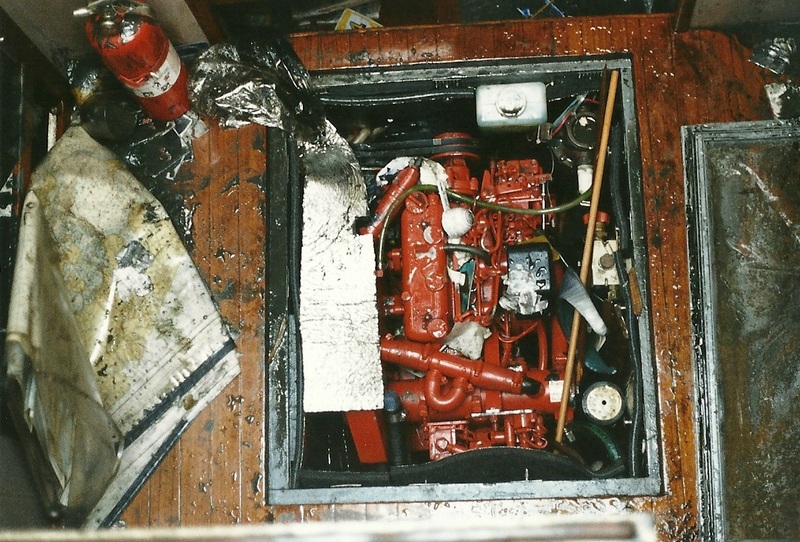 These photos were taken from high up in the rigging of the Charles W. Morgan. Not by me, I am too much of a chicken for heights and it was a clandestine visit to boot. Those were great times. 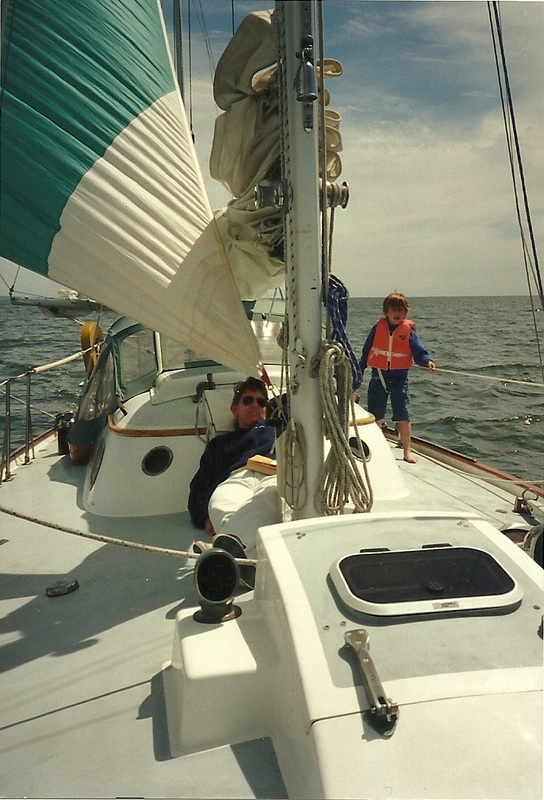 Then we were “post-catboat” and onto our much larger at 38′ long, a Pearson Invicta yawl Artemis. The boys were getting bigger too. Along the way, Chris and Pat decided to get in on the action and had one of their own, Travers, the first of two for them. The too got a bigger boat. 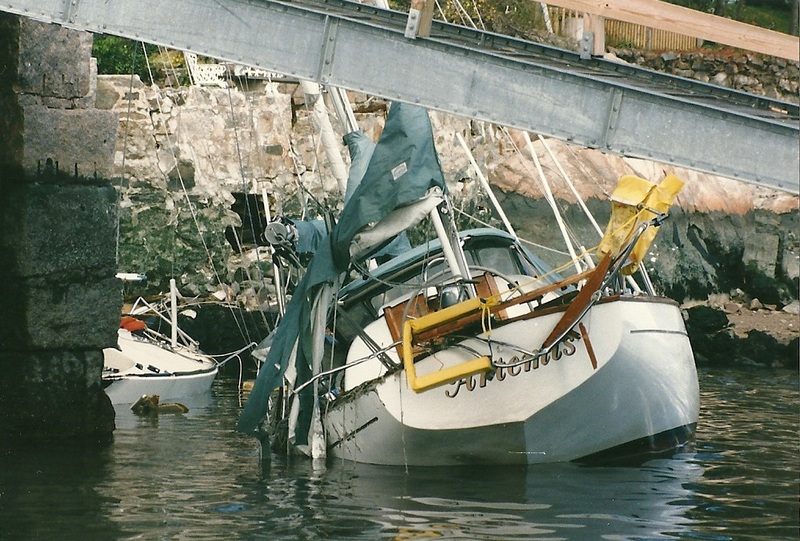 a Luders 33, which they still own, to this day. 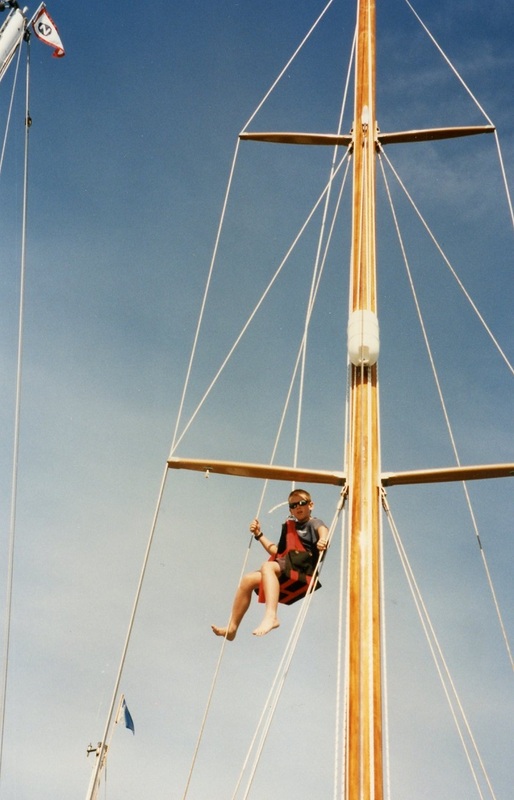 Always a bit of a daredevel, Rob always wanted to go aloft. 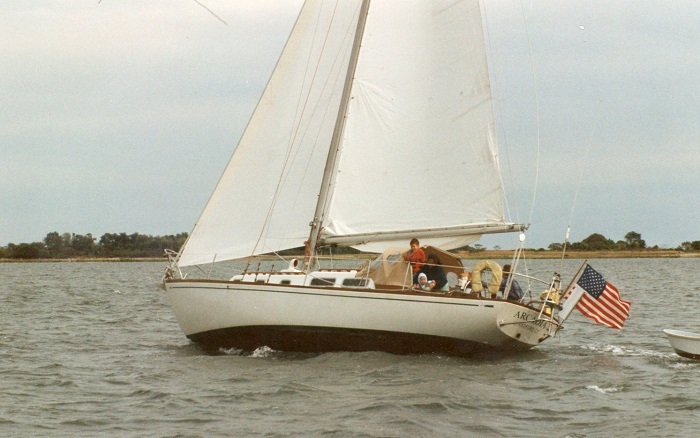 This time on a friends boat, a lovely, Alajuea 38, Cimba, owned by our friends Linda and Frank. 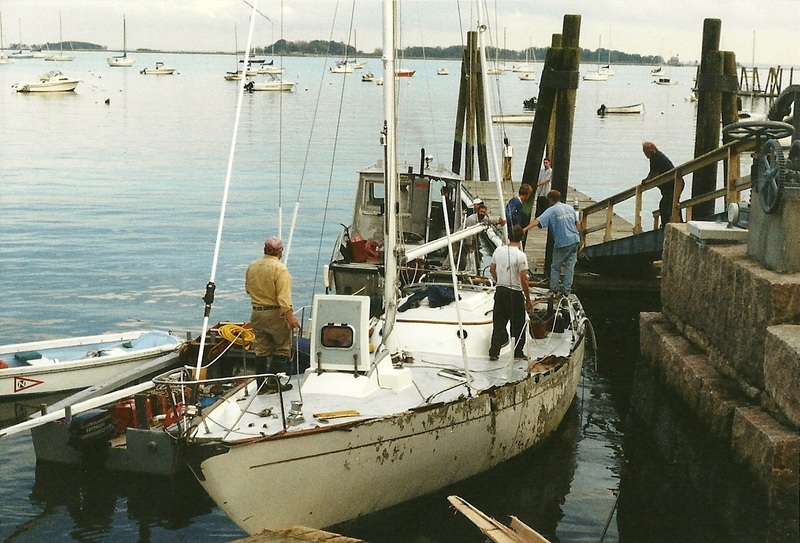 Years later they cruised all through the Caribbean, both east and west, staying away for 7 years before “retiring” to Maine. 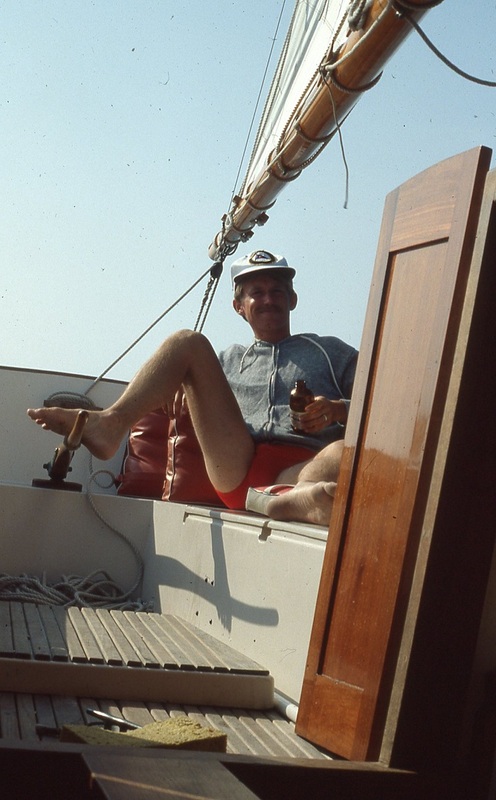 As an interesting side note, their son Peter, after growing up around all sorts of boats, opted to sail around the world when he graduated from college. His mother wasn’t amused but he made it back safely. 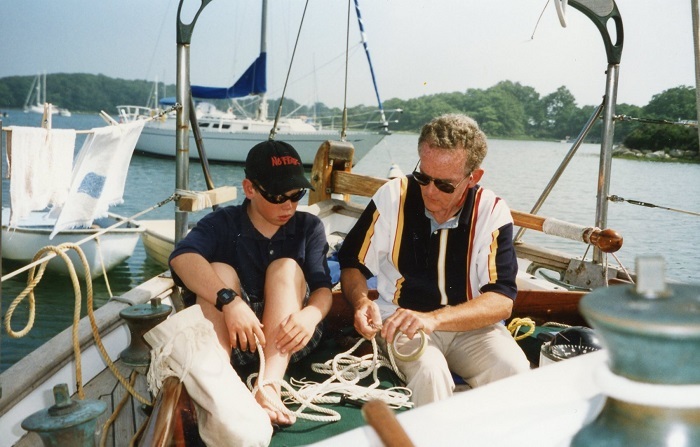 Frank spent time with Rob teaching him some knots. And yes, Rob was bigger then as well. 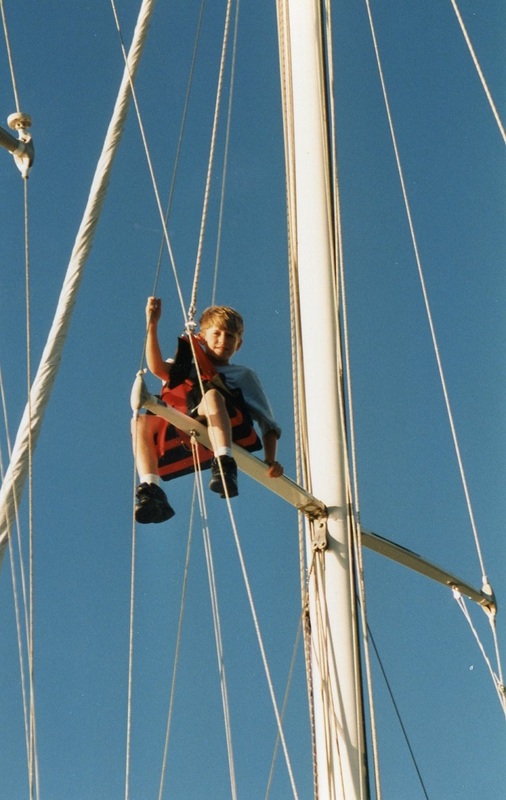 His brother Christopher wasn’t going to be left out from all that fun up the mast. 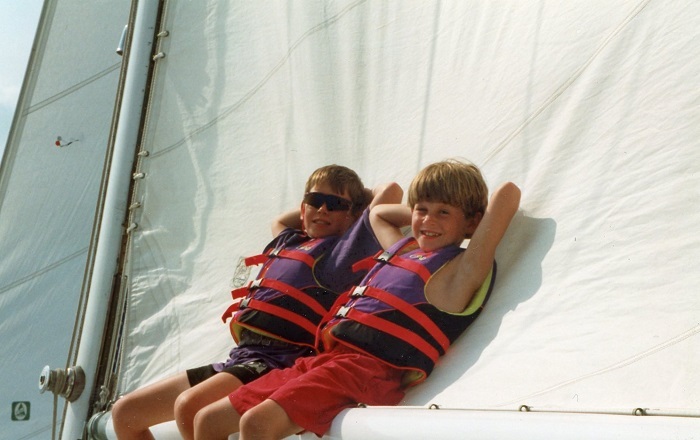 Both Chris and Rob were relentless in wanting to be aloft, sometimes when we were underway, to the constant torment of their Mother. 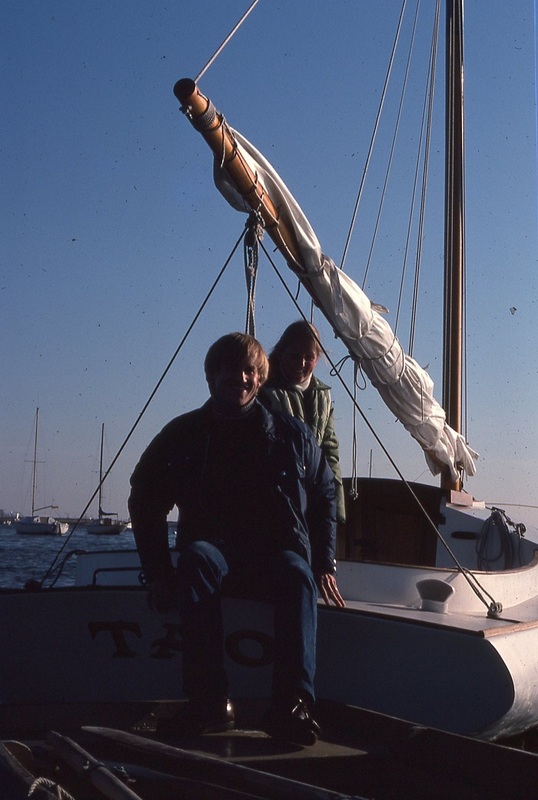 I recall a particularly fun time aloft for the boys as I put them each up the mast while we were sailing near Martha’s Vineyard West Chop, a particularly bumpy piece of water. As we bucked along each boy was repeatedly yanked up from the water, by the motion of the boat, and dramatically dumped into the next wave. They just loved it. As reported, their mother was not amused. 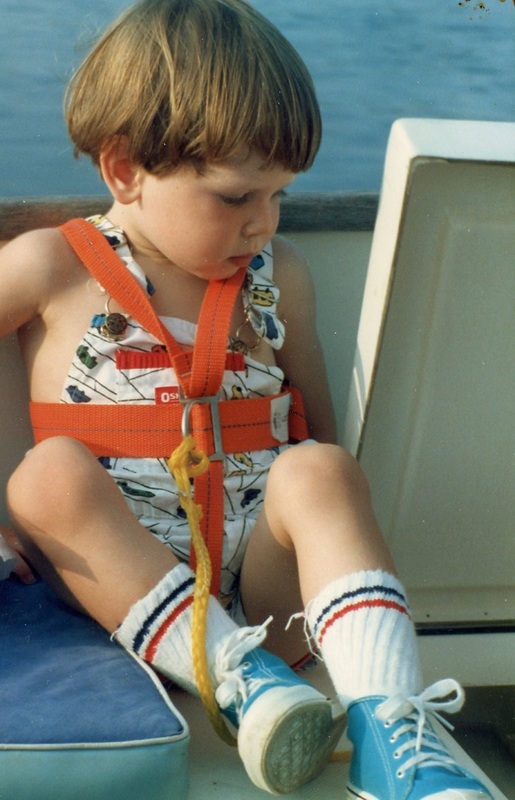 Perhaps the words of that pediatrician were still echoing in her head “are you sure that’s safe?” Probably not, but they were wearing life preservers and just loved it. Safe enough… I guess. Brenda much preferred it when they horsed around closer to the surface of the water. 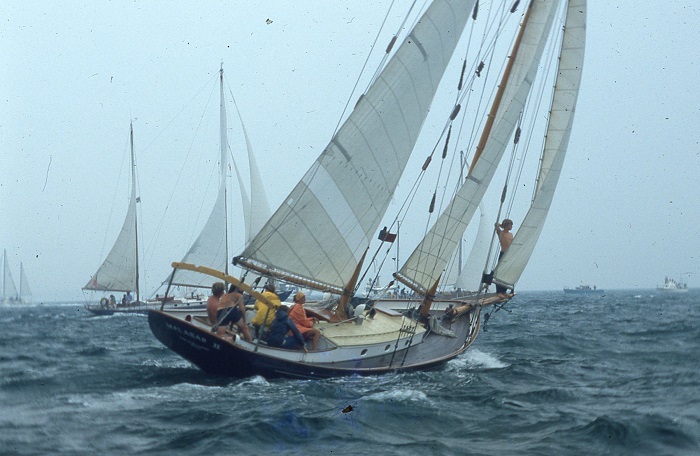 At that time we had a lovely little Dyer Dow, a great sailing dink. 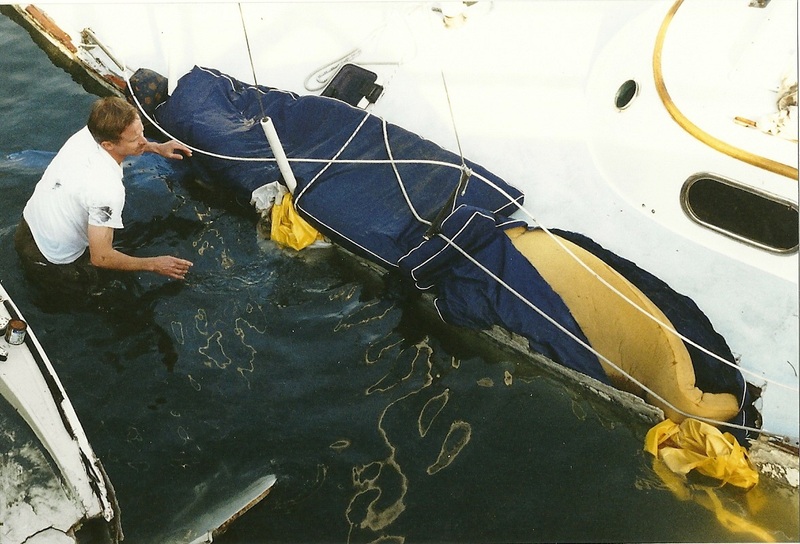 However, as we all got bigger, there just wan’t enough freeboard to keep us safe so we graduated to an inflatable, the first of many until I finally got the memo to spend the “big bucks” to get a quality brand that would last more than a few years. 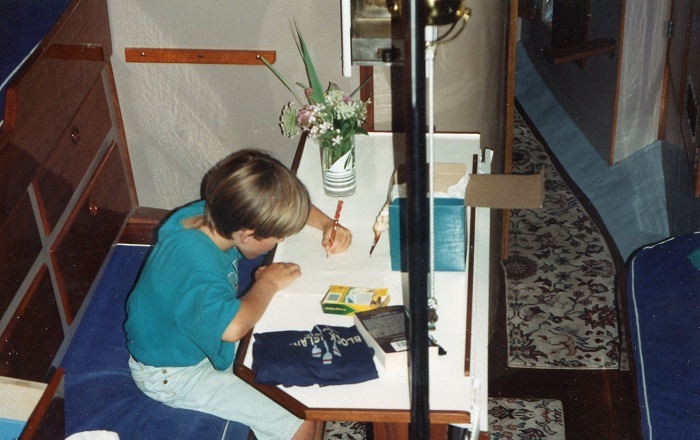 There was even some time for homework, or was it just coloring? 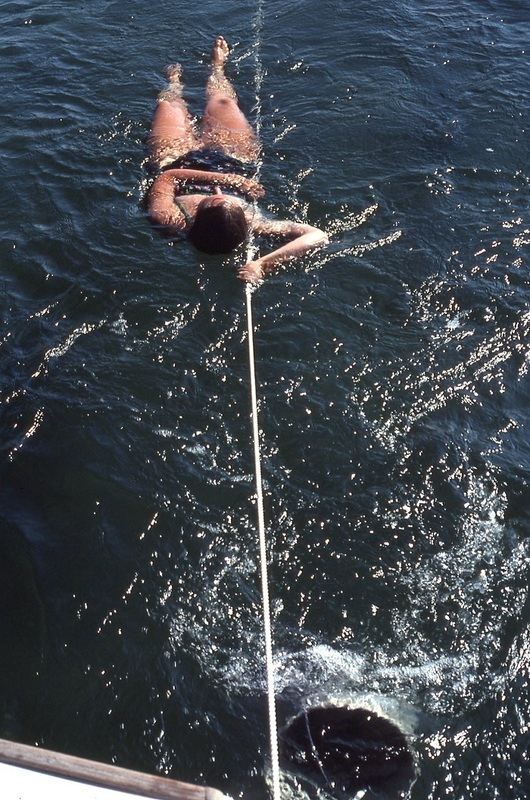 Sure enough, summer turned to fall but that didn’t keep us from the water. And yes, you can see, if you look closely, that Christopher is wearing a safety harness under his winter coat, attached to a lifeline, to keep him safe, of course. 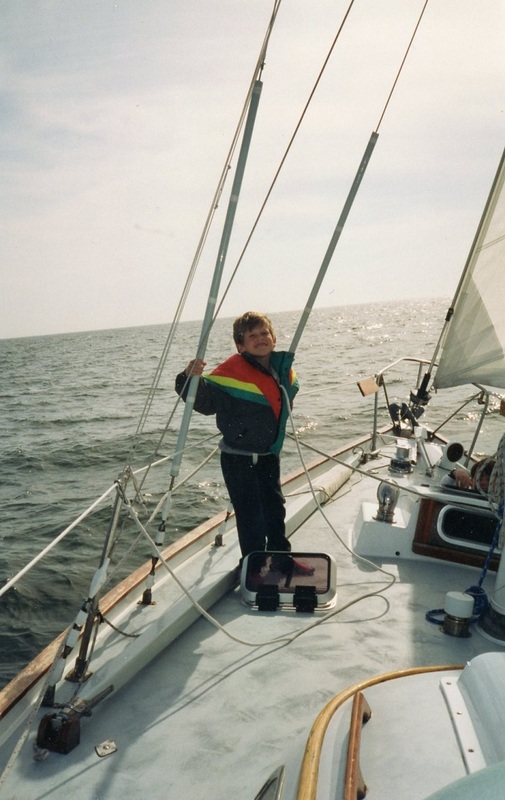 As you can tell, I’ve been digging again through old photos and it’s been a lot of fun thinking back on all those years sailing weekends and on summer vacations aboard a series of increasingly bigger and unfortunately, more complicated and way more expensive boats. 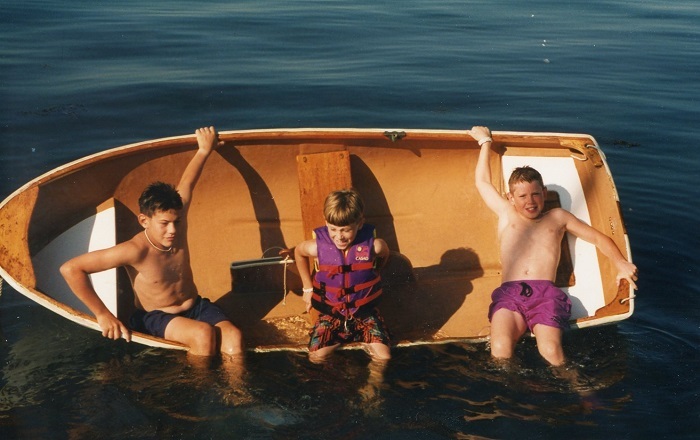 And, as the boats got larger and more complicated, so did the boys. 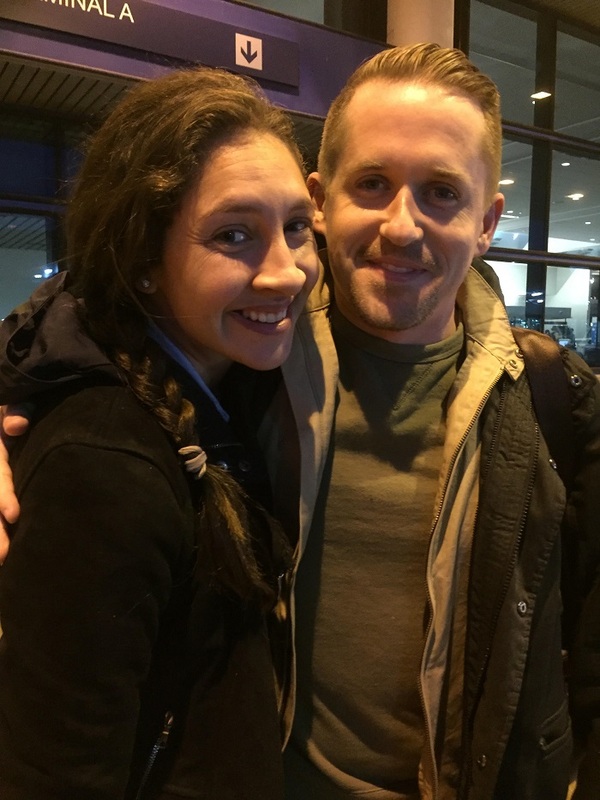 They are both out on their own now, Rob, with a rapidly growing family, “now they are five”, and Chris so far away, out in Oakland CA, which his mother and I just hate, the distance, not CA. But they are both doing really well and it’s great to watch them find their way in the world. Anyway, before I get too weepy, I’ll wrap this up. 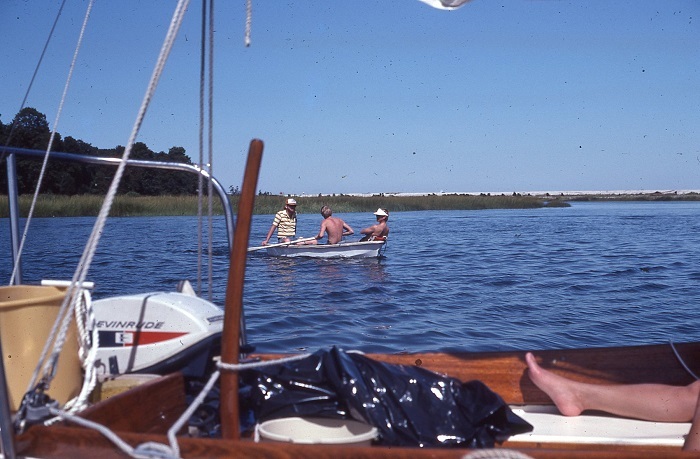 For sure, remembering is fun and we sure did have some really nice times aboard with the “boys on the boat”. Who knows, perhaps soon Brenda and I will be able to take the next generation aboard Pandora and begin the whole process all over again. 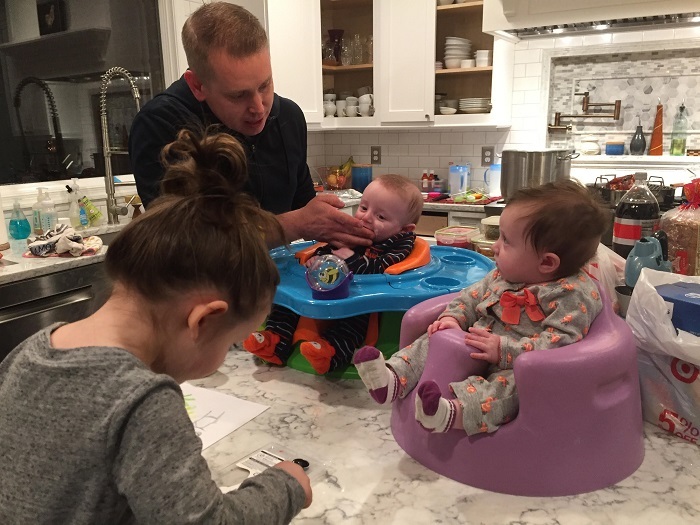 But first, we’ll have to convince the mother of those adorable grandchildren that the answer to that question posed by that pediatrician so many years ago “is that safe?” is yes. 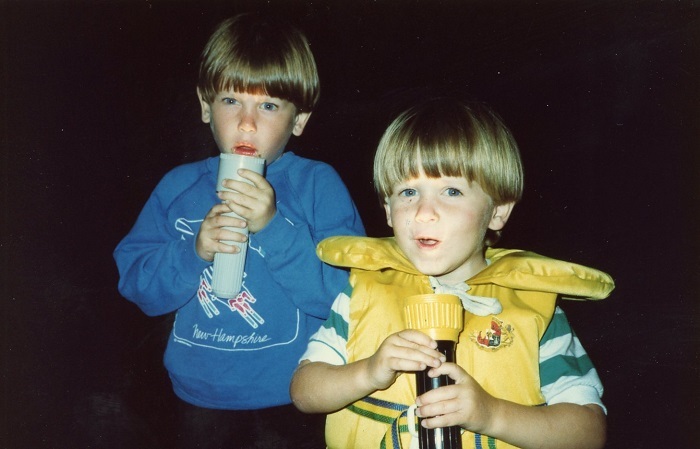 Who knows, perhaps one day one of them will decide to sail around the world. You never know… And, it would be doubly great if I’m still be around to follow along. When the time comes, if it does, perhaps I’ll find myself wondering and worrying too if it’s safe. However, talk to a derm and they will tell you, having seen so much sun damage and worse, over the years, that there is simply no such thing as a good tan. Yes, nearly everyone knows that excessive sun, or at least extra ultraviolet (UV) radiation, sunburn or not, is not good for you. According to the American Cancer Society, melanoma, the most dangerous form of skin cancer, can develop anywhere on your body, even those areas “where the sun don’t shine”. Interestingly, the risk of melanoma is increasing in people under 40 and understanding what to look for is important before the cancer spreads, leading to better survival. Unchecked, melanoma is often fatal, in part because even an advanced case often doesn’t look like much, more like a mole with irregular boarders. This image shows how innocuous it can appear. I am particularly focused on this because Brenda was diagnosed with melanoma three years ago after we got back from Cuba. 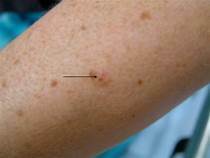 She had noticed a small spot on her arm some months earlier,when we were in the Bahamas, that looked a lot like the spot in the photo above but it wasn’t until we returned home in May that she had a dermatologist at Yale Medicine check it out. Fortunately for Brenda, hers had only progressed slightly beyond stage one, but that diagnosis was upsetting in itself as she was told that a recurrence was perhaps 1 in four, not great odds. Even though the lesion didn’t look like much, the surgery to remove it proved to be quite extensive, involving the removal of the equivalent of a modest “ice cream scoop” of tissue, all the way down to the muscle. Even more fun was that they then made an incision from the borders of the excised section that extended in both directions nearly to her shoulder and elbow. This had to be done so that they could pull the edges of the “ice cream scoop” together without causing a divot or pucker where the incision was the deepest. Additionally, they removed some sentinel nodes in her armpit for testing to see if the cancer had migrated beyond the lesion on her arm. Fortunately, these came up negative. The point of telling you this is that even the smallest melanoma is a big deal and is generally dealt with aggressively, which speaks volumes of the danger that it represents. 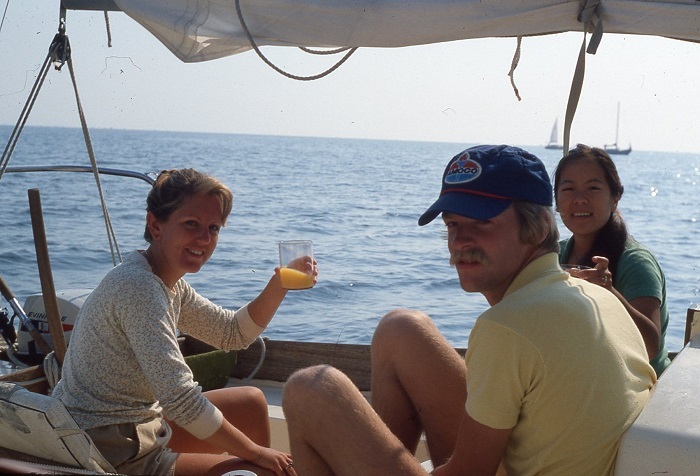 When Brenda was diagnosed, we did wonder if our sailing days were over because of the need to avoid unnecessary exposure to the sun going forward. 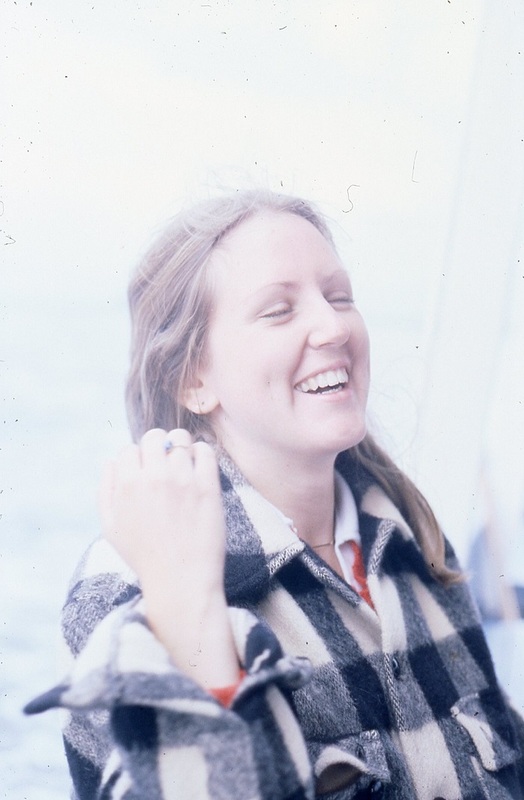 For us, it was doubly important that we find out how much protection from UV that Brenda would have aboard during the brightest portions of the day, from around 10:00 to 16:00 hrs, when the sun was most intense. With this in mind, I purchased a testing instrument from General Instruments that would accurately measure both UVA and UVB light waves, the parts of the light spectrum that have been identified as being the most damaging to skin. 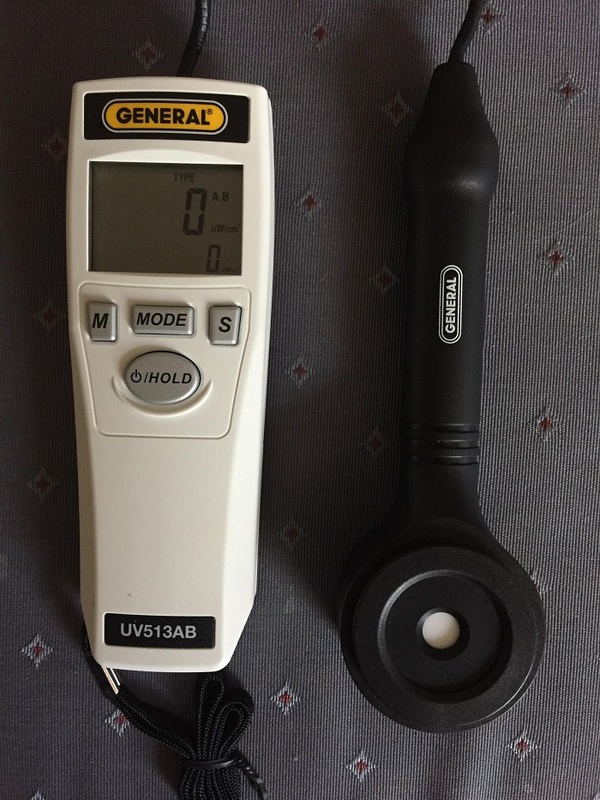 According to the instrument maker’s website, “The #UV512C UVC light meter is ideal for applications such as UV curing and sterilization, semiconductor fabrication, offset printing, environmental monitoring and industrial process control.” Ok, sounded pretty official and scientific to me. The big question was how much UV would Brenda be exposed to at “high noon” in the Caribbean, aboard Pandora, where we spend a good deal of time each winter. We’ve also heard, over the years, that you can get a bad burn from “reflected UV” off of the water and this alarmed us as, even with a bimini overhead, it seemed to be an impossible task to eliminate the UV coming in from the sides of our enclosure, reflected off of the water. In theory, Pandora has better sun protection than most with her hard dodger and fully enclosed cockpit. As an aside, you may be wondering if being enclosed all the time is too hot in the tropics, it isn’t. Actually, the full enclosure has proven to be particularly helpful at keeping the relentless trade winds to a manageable level. However, up in the NE, where the winds are often light, we need to open things up much more. 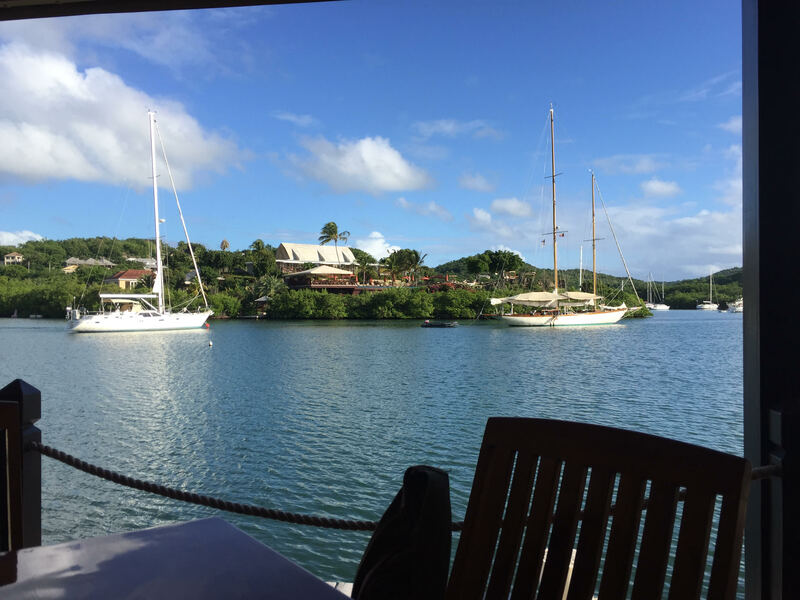 When we were in Antigua, and that’s plenty far south with really intense sun, even in the winter months, I took a number of measurements, with the meter, at noon when the sun is most intense. Here’s what I found, some of what surprised me. Control: As a control I took measurements directly into the noon sun, in a cloudless sky. The reading, and the highest that will register on the instrument, weas 10,000 units. Deep shade, away from the water, registered between 500 and 600 units, about 5%. Sunscreen: Then I put a small piece of plastic wrap over the sensor and checked full sun again that showed readings in the 8,500 range, suggesting that very thin plastic wrap let through most of the UV light. Next, I put a very light smear of SPF 15 sunscreen and the reading, again in full sun, was about 2,000. With a thicker spread of SPF 15, half of that. SPF 60 yielded a reading of 600, a lot less, about the same as in deep shade. Surprises: Perhaps the most interesting readings came from pointing the unit toward the sun at 45 degrees off of the water, simulating “reflective light” where I only received a reading of 2,000, only 20% of full sun. That was much less than I had expected. Further, in the middle of the cockpit, where the light was still very bright, the measurements were equivalent to deep shade. 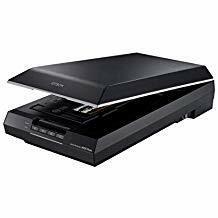 Vinyl blocks UV: I also took measurements through the clear plastic of the vinyl dodger, both new and old material, and the measurement was, again, zero. Even old and weathered vinyl cut out 100% of the UV rays. I found that astonishing, however I guess it does make sense as the material is treated to resist UV degradation. Glass does not block UV: My hard dodger has large pieces of tempered glass and I was surprised to find that it only blocked 10% of the UV rays. 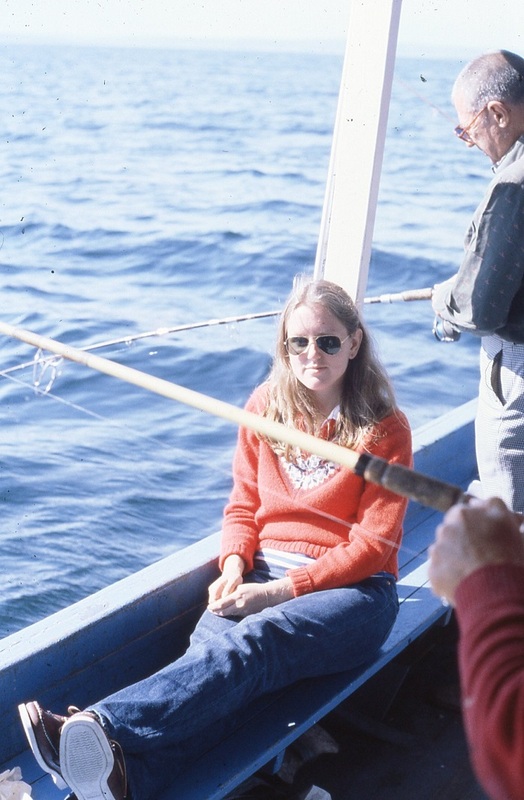 All of this suggested that during the brightest parts of the day Brenda was very well protected under the bimini, even if it seemed so bright that sunglasses were required. Clothing protects from UV: So, what about clothing? I tried an old white T shirt and found that, even when wet, it blocked about 95% of UV with a dry shirt letting through somewhat more. I was particularly surprised by that given all the hype about UV protective clothing. My test suggests that just about any clothing that covers you up works well, even if it doesn’t have a “UV rating”. I guess that putting a UV rating on clothing is about the same as saying that a particular shirt has “100% blockage against vampires”. Works for me. All of this is good news but I guess that the most surprising thing to me was how low the UV exposure was under the dodger and bimini. And that clear vinyl windows were just as effective as being down below when it came to exposure, and that even the lightest white clothing, “UV protected” or not, provided good protection. The good news for Brenda is that two and a half years out from her surgery she is doing well and her doctor told her recently that her risk of recurrence now is “very, very small”, which is good news. His advice to her is that it’s OK to continue spending time aboard Pandora but to always use plenty of sunscreen and to do her best to stay out of the sun when it is most intense. One way or the other, we are taking his advice very seriously but it’s nice to know that being aboard Pandora we can still manage the risk. So, there you have it. reflected UV isn’t nearly as much of a problem as everyone thinks, sunscreen really does work and most any clothing does an excellent job of keeping harmful UV out. We continue to keep our fingers crossed that Brenda won’t have a recurrence and every year that passes makes that less likely, which is good news. All and all, this experience has certainly made the phrase “there’s no such thing as a good tan”, means more to us than ever. Ok, so with our UV exposure in the winter up here in New England so low, I wonder if we will develop a vitamin D deficiency. Great, something new to worry about. I can’t wait till May. Are we there yet? 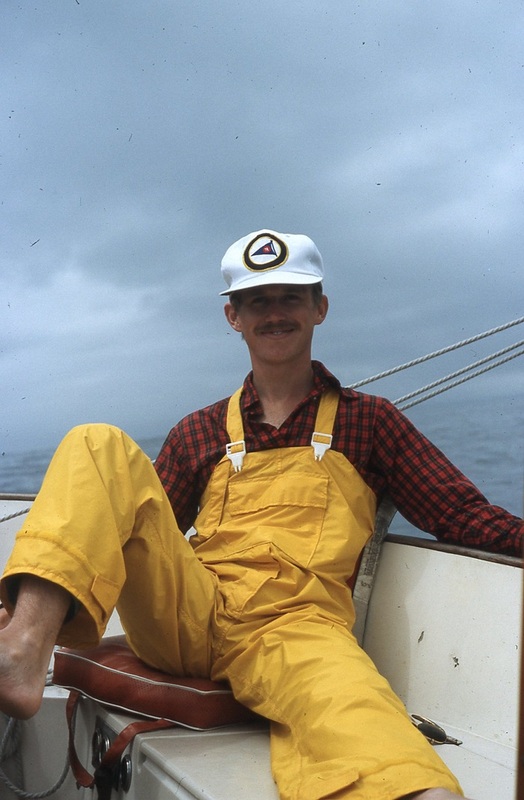 Headed back to Canada, 40 years later. This time, aboard Pandora. I have recently written about our plans to visit the Bay of Fundy and the St John river next summer. 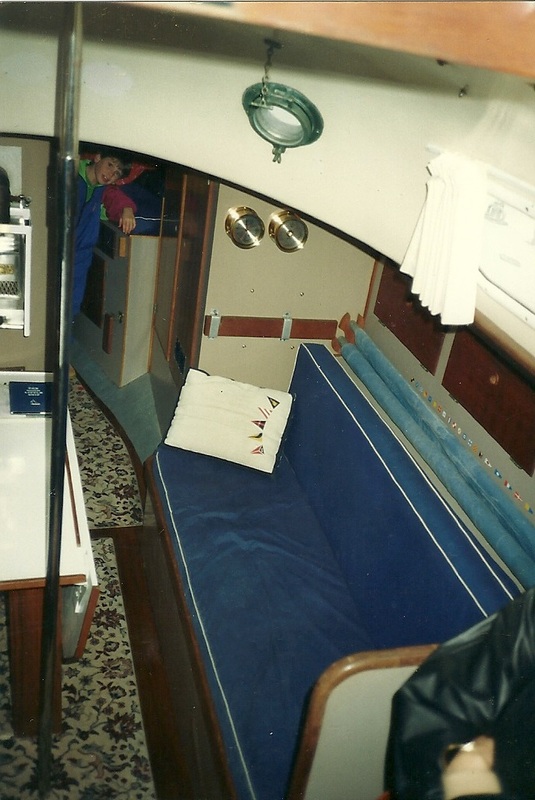 It will be our first trip there on our own boat but not our first trip there, “aboard” a boat. As I have mentioned, I have been digging through some old photos lately and have come up with some wonderful images that conjure up many great memories. 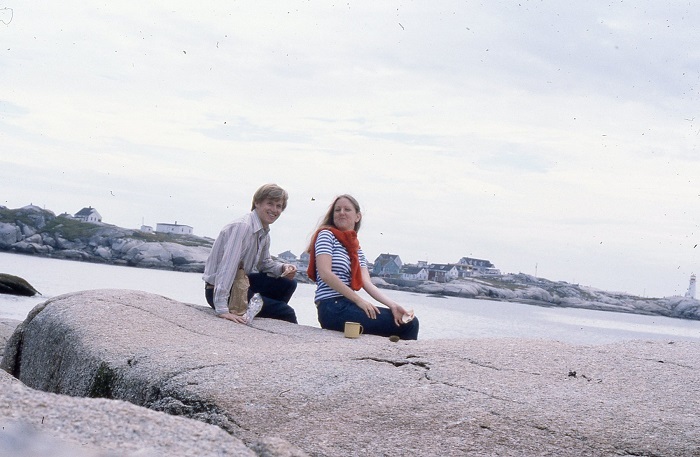 And speaking of old photos and visiting Canada, our last trip there was a REALLY long time ago, way back in 1979. 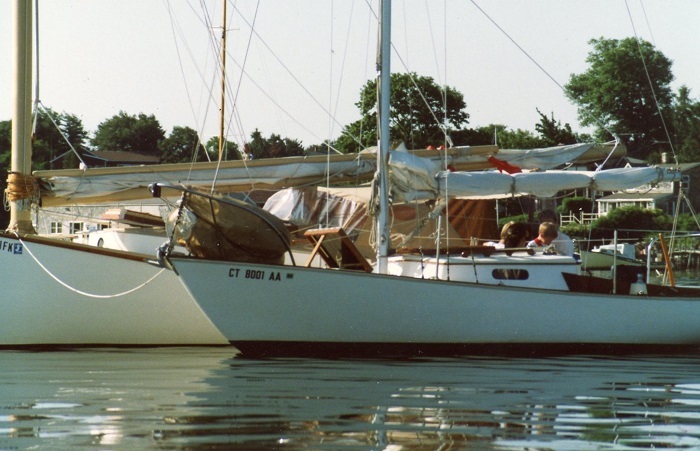 We had only been married for about two years and hadn’t even thought about buying a boat. While our trip this coming summer won’t take us across the Bay of Fundy to Yarmouth, I expect that many of the spots we’ll visit will have the similar, otherworldly feel that makes the coastline so beautiful. 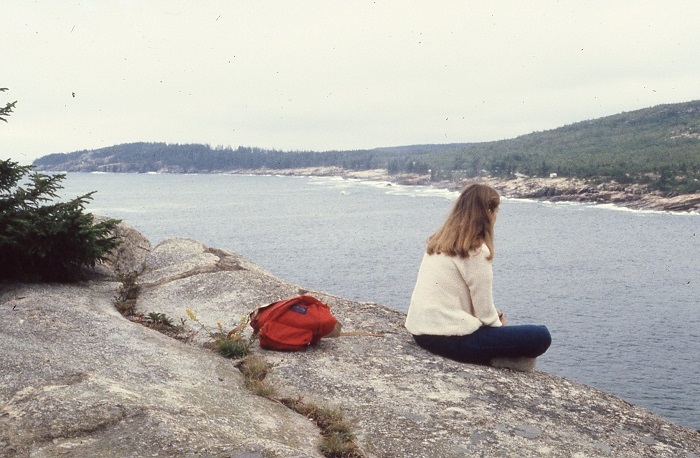 Our trip, so many years ago, was by car and began in Portland ME where we caught the overnight ferry to Yarmouth. We splurged on a sleeping cabin. No, this isn’t a view of our cabin and I’ll admit that I can’t recall much except that Brenda didn’t eat dinner as she felt queasy. 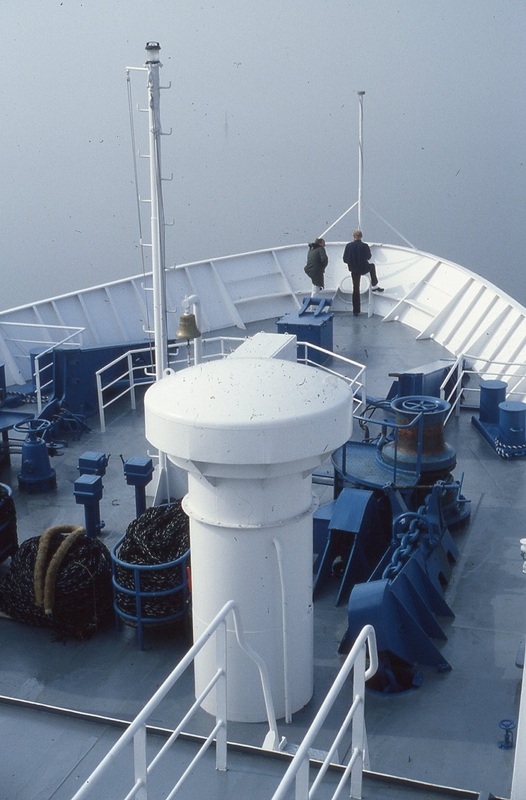 The bow of the ferry. 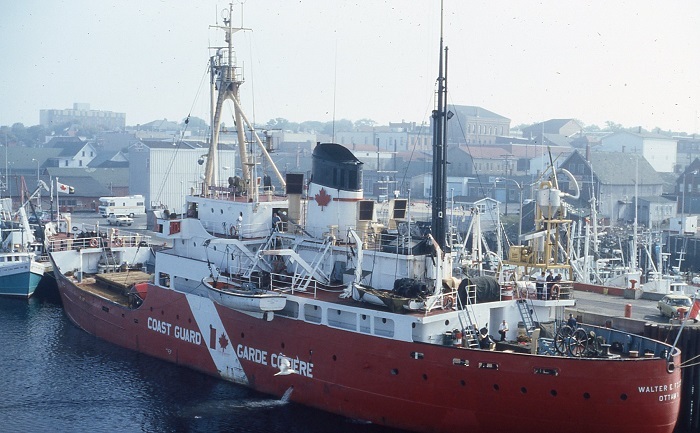 And speaking of queasy, the muscular build of this Canadian cost guard boat gives a pretty good feel for how rough it can get out on the water there. 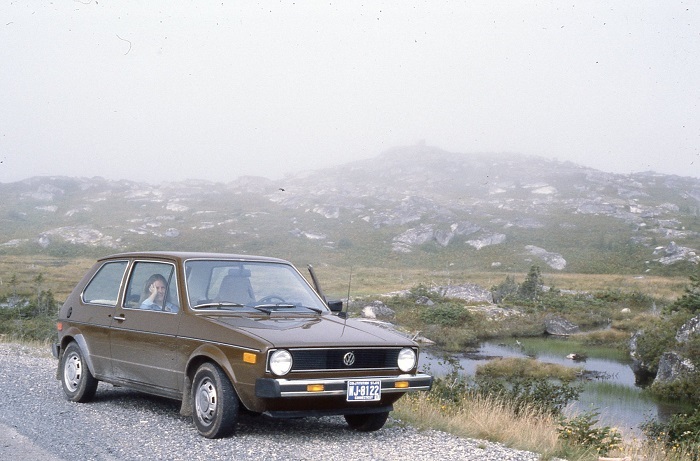 We brought along our car on the ferry, then a tiny diesel VW Rabbit. Remember them? That car got AMAZING mileage, about 50 mpg, on average. And, I remember that diesel was $.47 a gallon. And, during the oil embargo I sometimes bought fuel oil from a place in Bridgeport CT. I’d pull up to the heating oil place and they’d snake a hose out from the shop and fill me up. Totally illegal. Ah, those were the days. I won’t talk about my income in those years. About as low, or perhaps lower than the price of fuel. I was selling advertising for a local free newspaper. We have always loved lighthouses and to this day go out of my way to visit them when we travel. 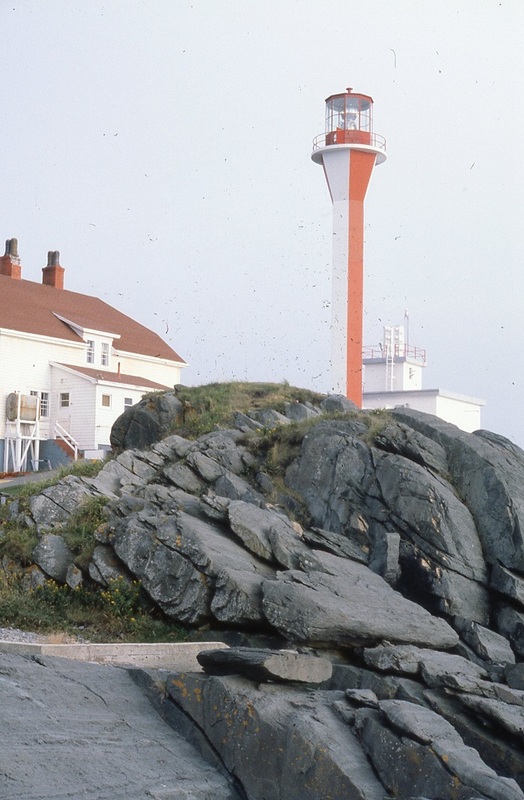 This one, in Yarmouth is on Cape Forchu is well known and often photographed. We climbed up to the top to take in the view. The light went round and round and as it passed, you could feel the heat of the bulb as it passed, like a rotisserie. Brenda thought it was great too until the foghorn went off. It was so loud that it made us weak in the knees. 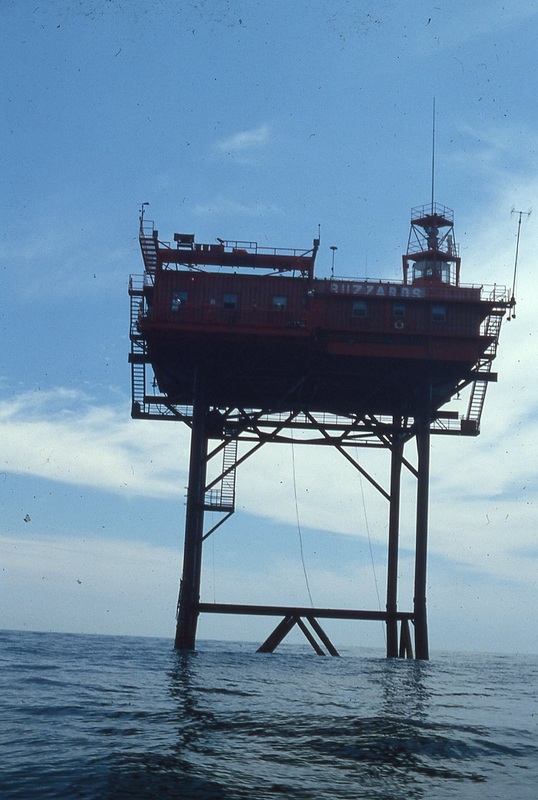 To this day it still takes some coaxing to get her up in an active lighthouse. We have only camped in a tent twice together, the first time was while we were in college, near Niagara Falls. It rained the whole time and we quickly learned that the tent was not waterproof and that didn’t even include the fact that there was no bottom to the tent, waterproof or not. Water coming in from above and below. 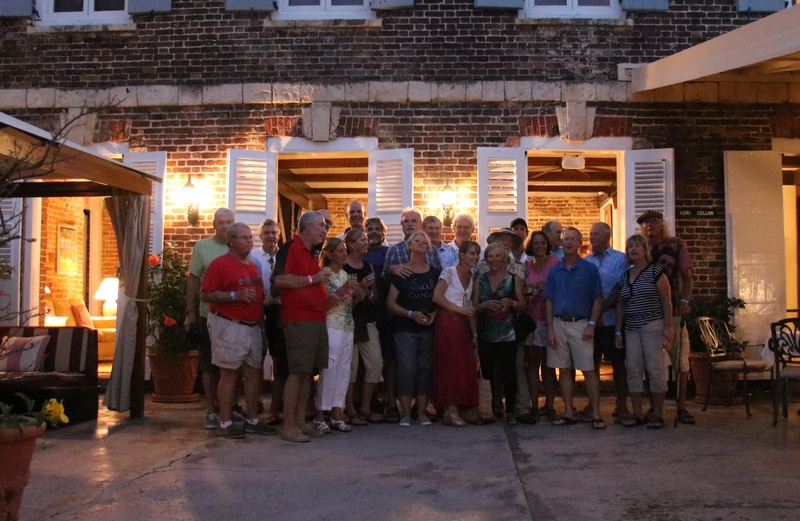 On this trip we split our time camping and visiting Bed and Breakfast inns. 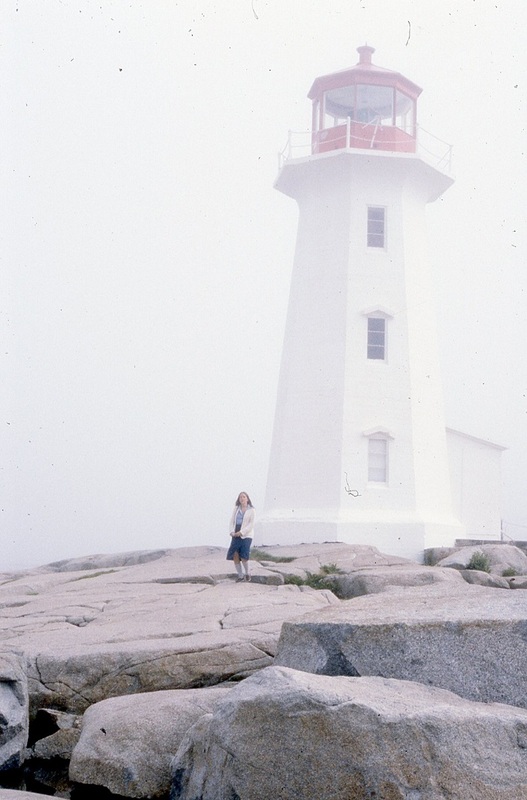 I still vividly recall our camping near Peggy’s Cove on a bluff overlooking the North Atlantic, with the fog rolling in. Not a luxury tent, to be sure. Not a great shot but I include this as it features our wok, perched over an open fire. We filled it with seaweed and added two lobsters. That wok has served us faithfully for all these years. We still use it nearly every day. After that trip it was really well seasoned. 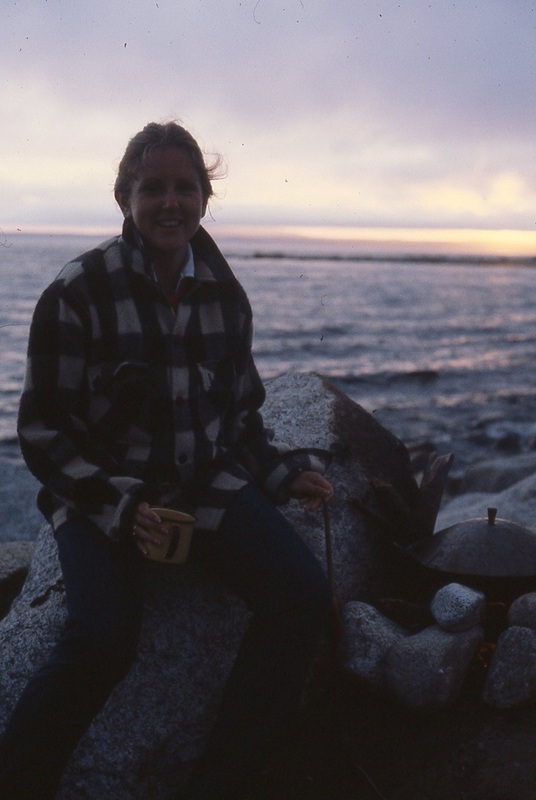 One evening, or was it the only evening we camped there?, we heard someone playing bagpipes in the waning twilight. It was a remarkable moment with the forlorn music and fog wafting over the campsite. We really enjoyed the time up there. We were so young. Mere kids. To this day I still get a thrill when I see a schooner. 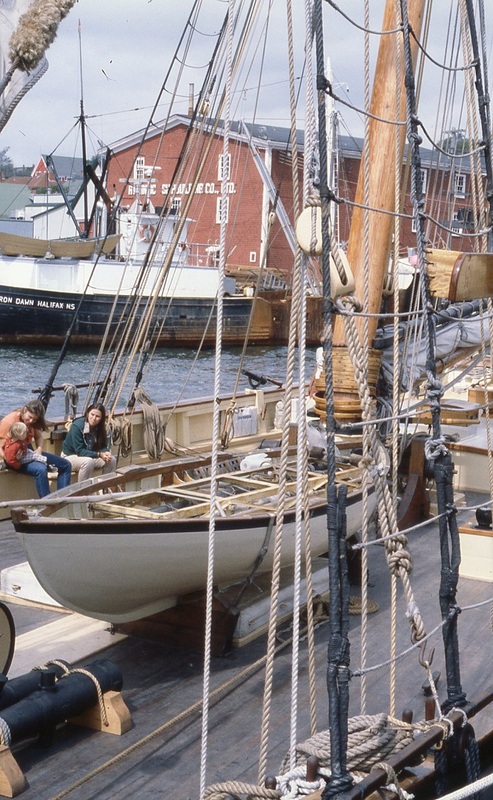 On this trip we went out for a day sail on the schooner Bluenose II, a reproduction of a classic Grand Banks fisherman laucnhed in the 1920s. 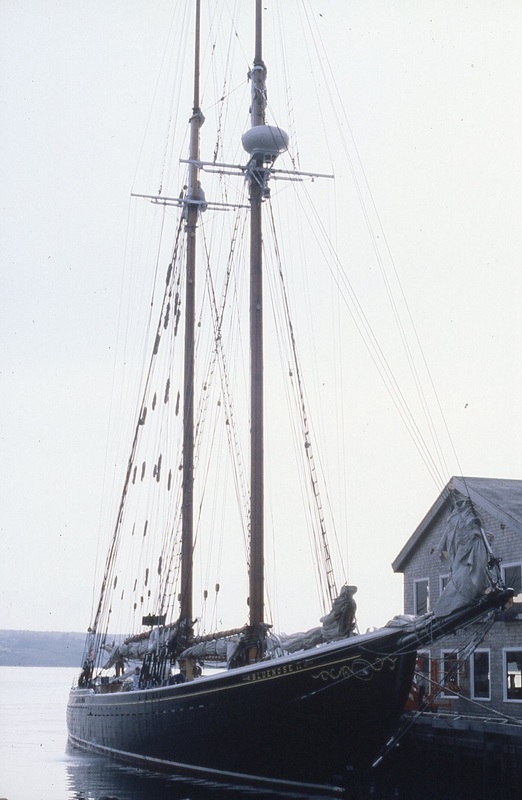 The original Bluenose was the fastest fishing schooner in the fleet and is still regarded as perhaps the fastest ever launched. 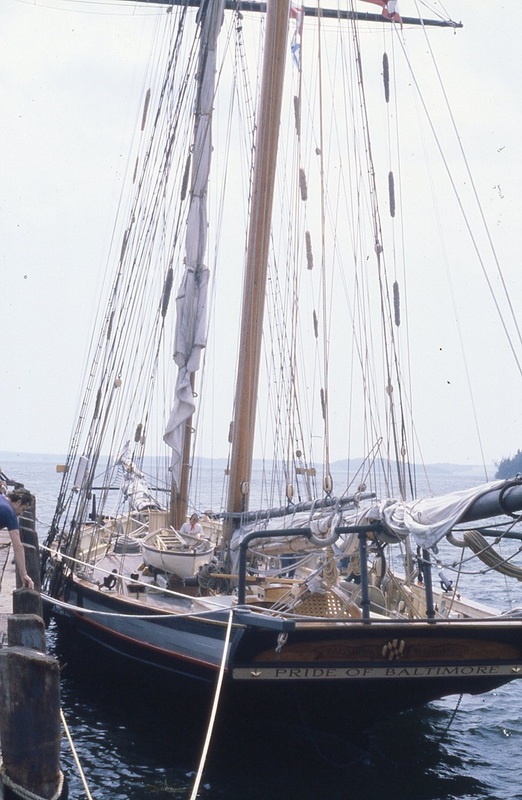 The “new” Bluenose is a roving ambassador for Nova Scotia and travels widely. 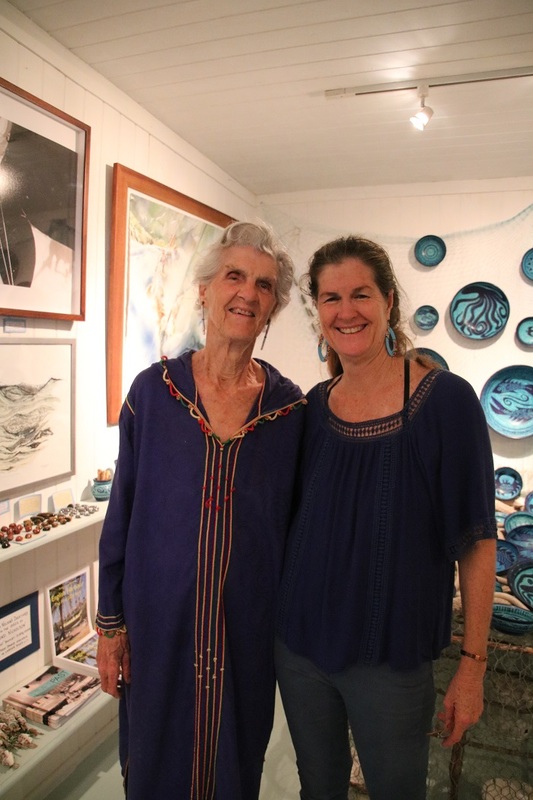 Brenda is a prolific fiber artist, graduating from her early focus on knitting. I believe that this may have been her first sweater knitted with “real” yarn. This particular photo is one of my all time favorites. 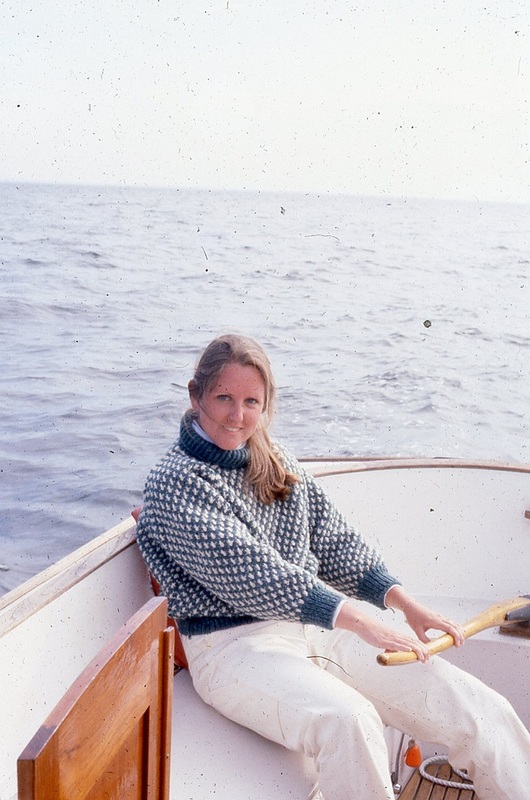 When she was younger, but not a lot younger than she is in this photo, she didn’t have access to good yarn, or any, for that matter, and had to knit a single ball of red yarn, probably (gasp) acrylic, rip it out and knit it up again. She still has to rip things out but not because of a lack of good yarn. Quite the contrary, her “stash” is prodigious. The Pride of Baltimore was visitinng. 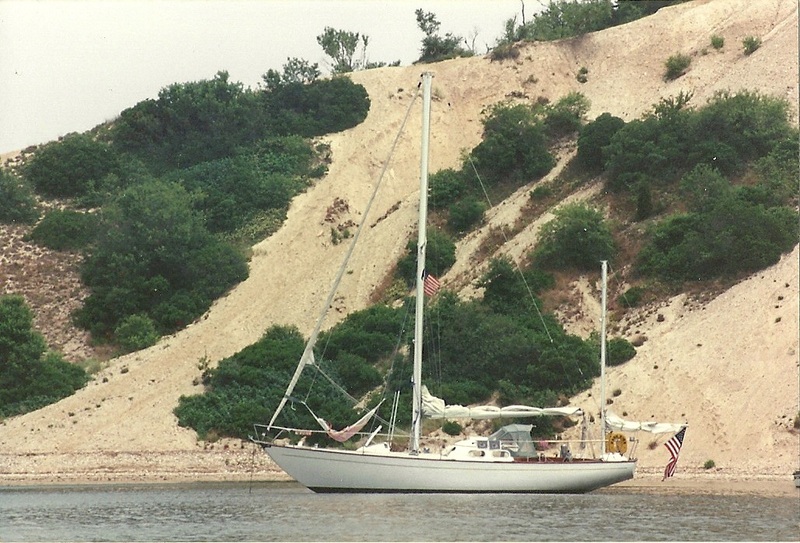 She was a reproduction of a Baltimore Clipper launched in 1977, the year Brenda and I were married. 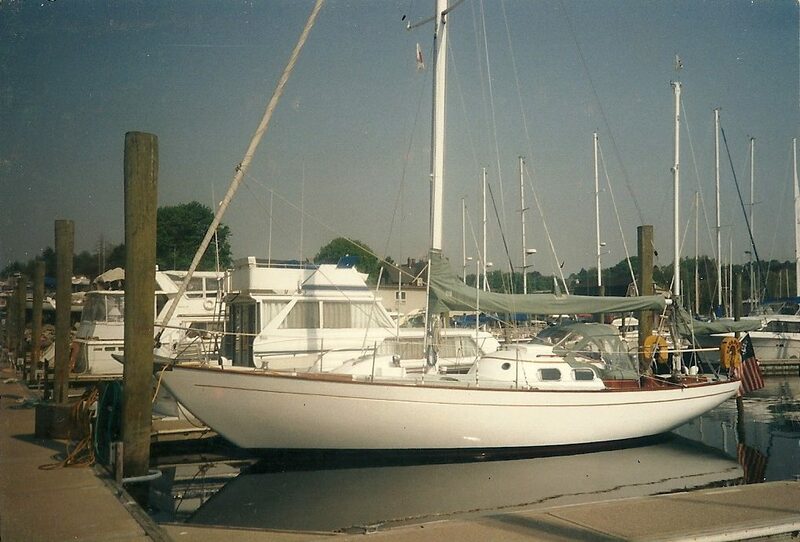 She a sailed over 150,000 miles as an ambassador to Baltimore MD. However, while her design was fairly faithful to the original type, that proved to be a problem as she lacked some of the modern safety features now common which proved to be her undoing. 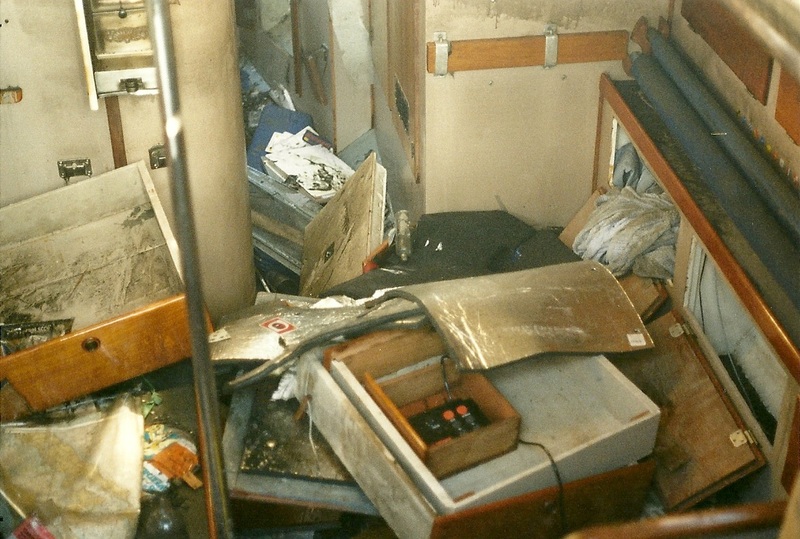 Unfortunately, she sank in the Caribbean in 1986 with the loss of captain and three crew. 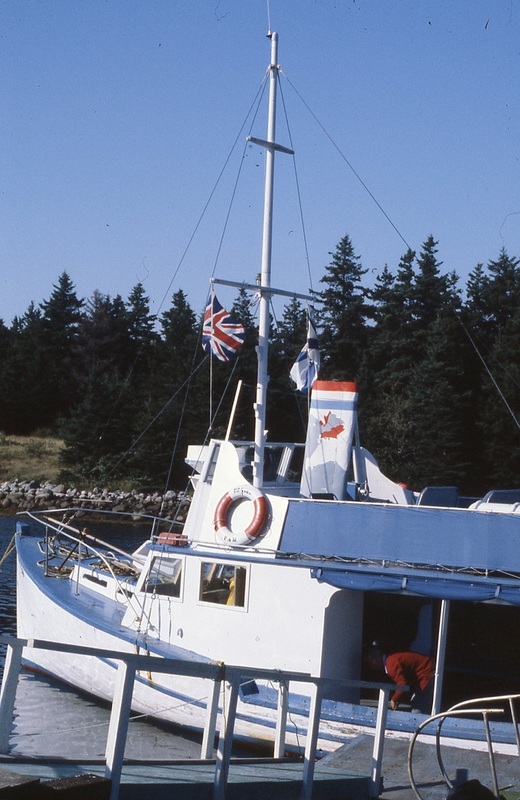 Her successor the “Pride” II has watertight bulkheads and was built to more modern safety standards. 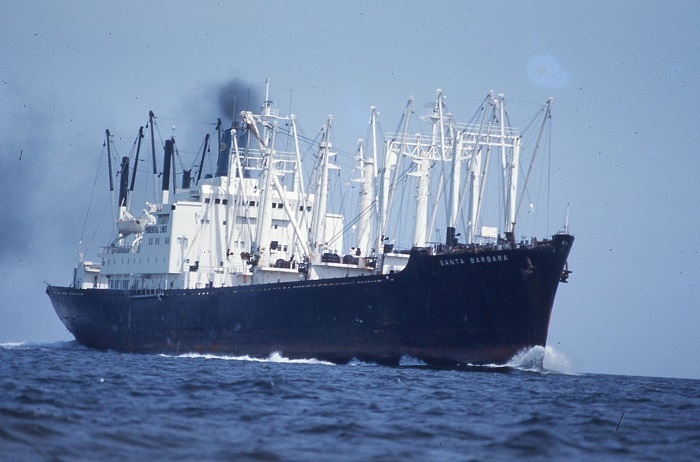 Pride II has sailed over 300,000 miles, visited over 200 ports in 40 countries over her now 30 year career. Pride was quite authentic down to her beautiful gig. 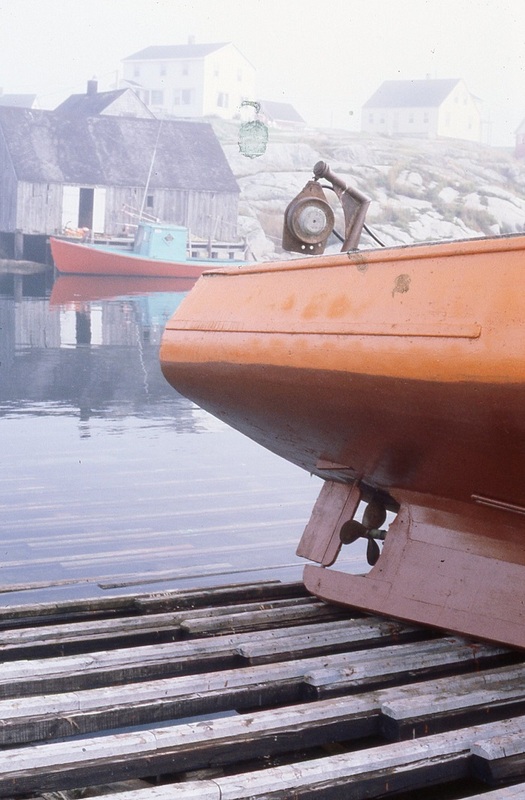 In the “they don’t make them like they used to” category, how about the hull of this fishing boat? Not a lot made these days of planked wood. She’s a beauty, or at least once one as she’s certainly long gone. 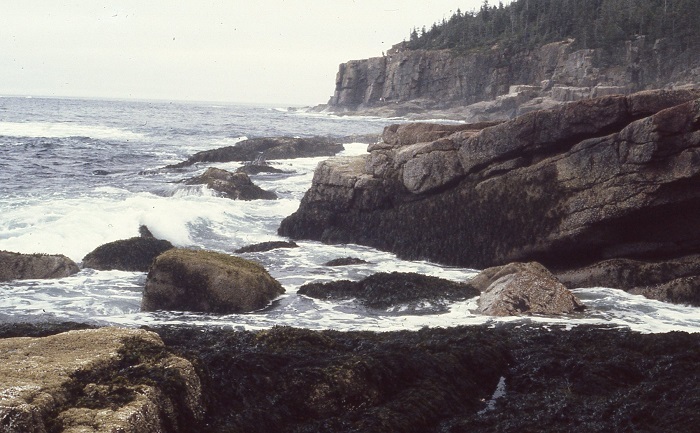 The tides in the Bay of Fundy are known as being among the highest in the world, as high as 40′. That’s a lot of water moving in and out of the huge Bay of Fundy, twice a day. As the tide floods the water surges in, moving a small wave ahead of it. This is referred to as a “bore” and is pretty impressive to see as the ridge of white water rolling inland across any inlet or bay. 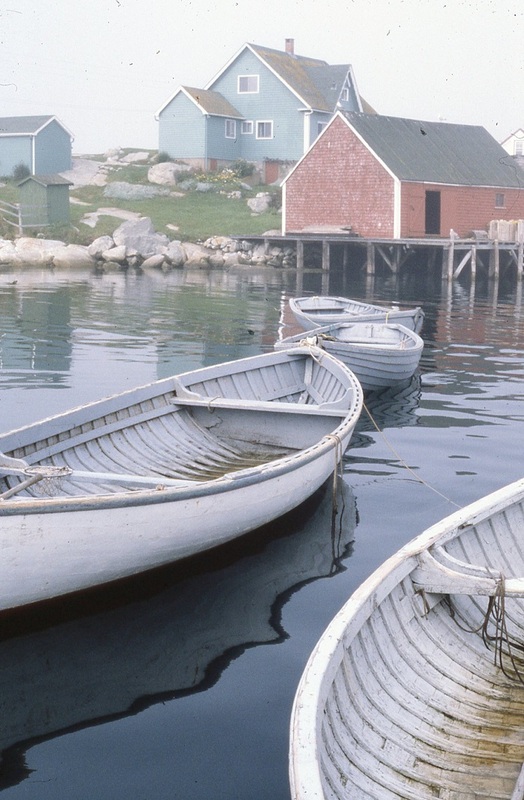 Perhaps the most photographed harbor in Nova Scotia is Peggy’s Cove. 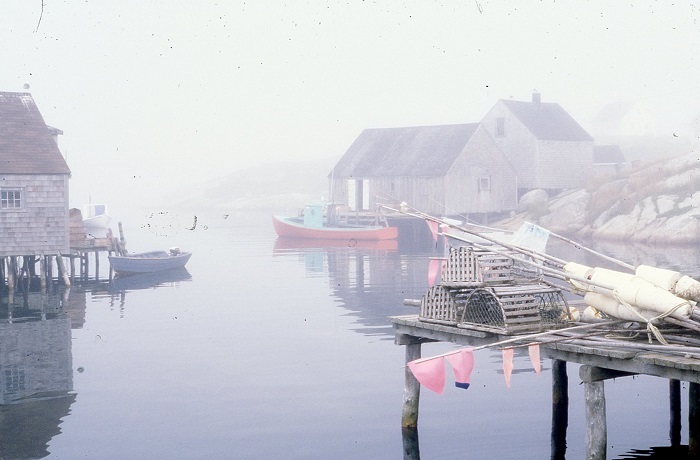 It’s an impossibly quaint fishing village on the eastern shore. 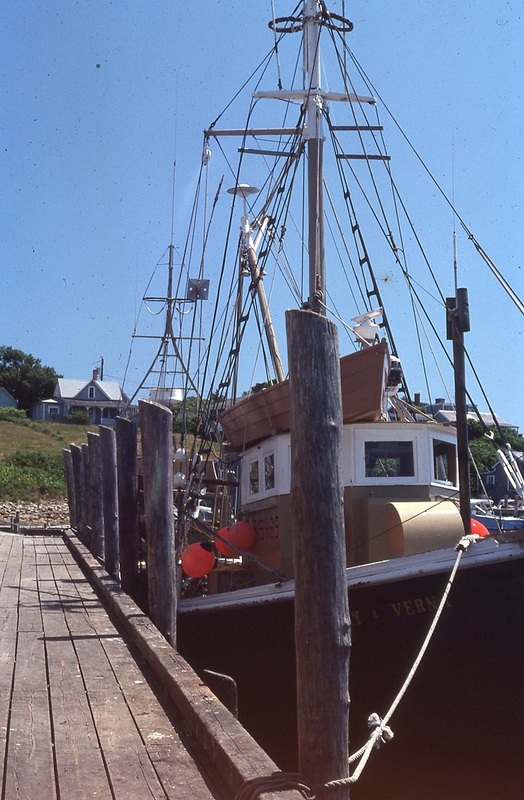 Charming fishing boats at every turn. 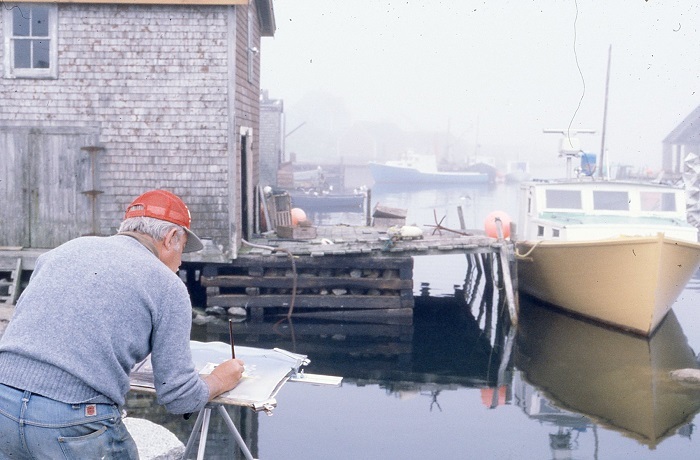 Where there is “quaint”, there are artists capturing the view. 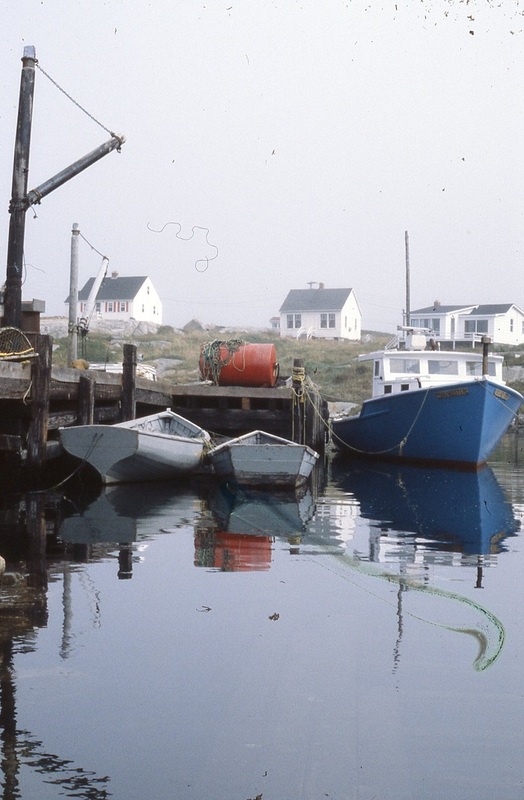 Peggy’s Cove is no different. 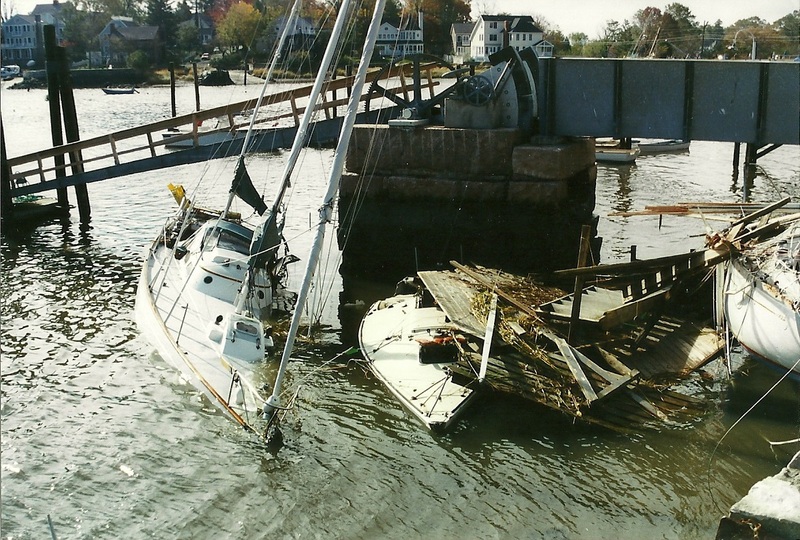 With big tides, all you have to do to haul a boat is to pull it up at high tide and let the receding tide do the rest. 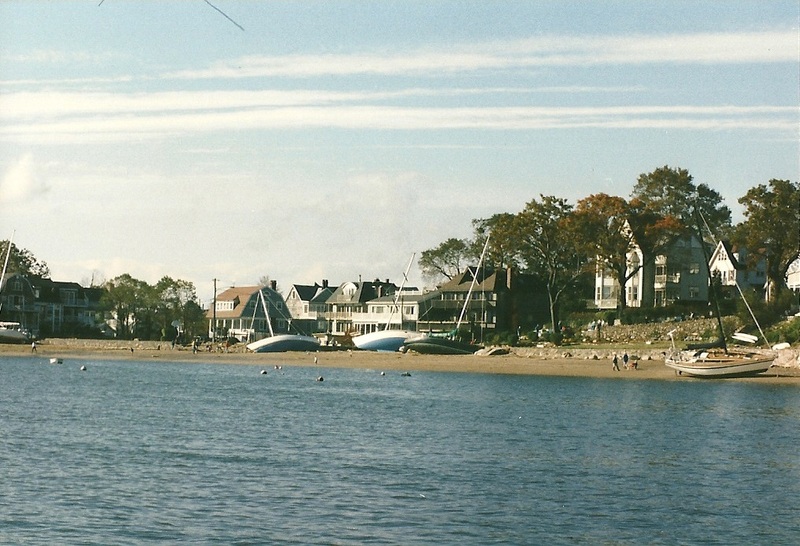 Just about all of the boats we saw were still built of wood and the cottages surrounding the harbor, oh so quaint. I expect that many of these have been sold, over the years, to summer residents, known in Maine as “from away”. We visited, of course, the local lighthouse. Looks like Brenda’s waiting for the wind to blow up her skirt. 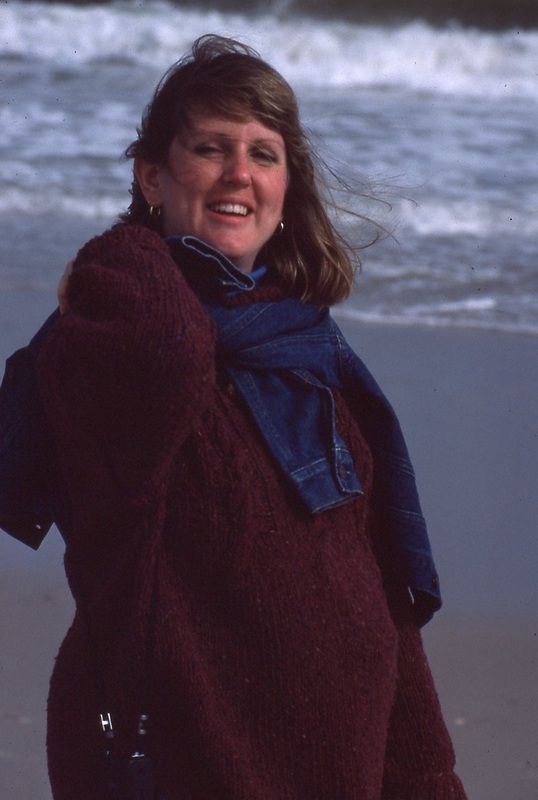 Me too… And, speaking of breezy, the coastline here is quite rugged and windswept. I can only imagine what it is like in the dead of winter. With the constant wind not a lot grows higher than knee high. We went out on a day fishing boat, jigging for squid and even caught some cod. Ready to head out to sea. We even caught a flounder, sole, fluke, something like that. It’s flat anyway. 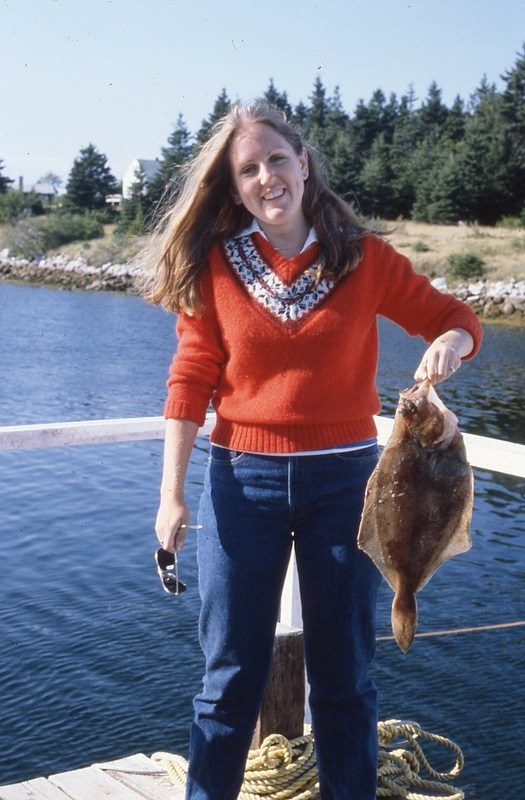 Not sure she’d “soil” her hands on an icky fish these days. 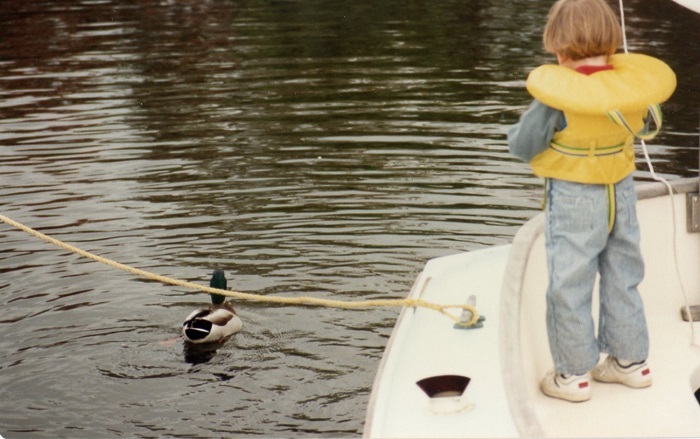 It was on this very trip that we talked about buying a boat for the first time. 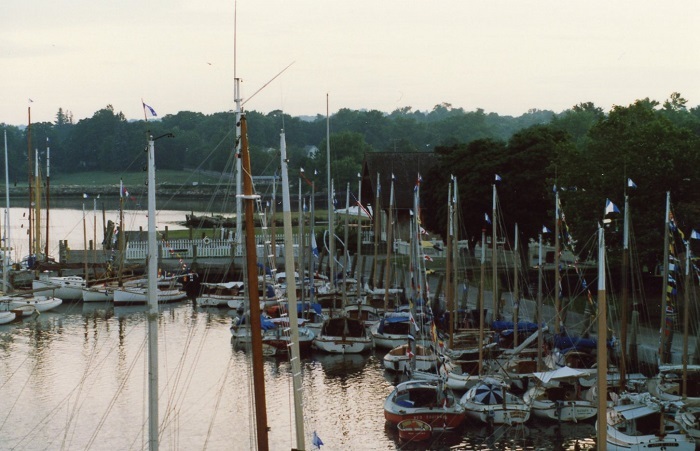 There was a small boat show in Yarmouth, If I recall. I expect that this photo was taken when I said “Hey, let’s buy a boat”. 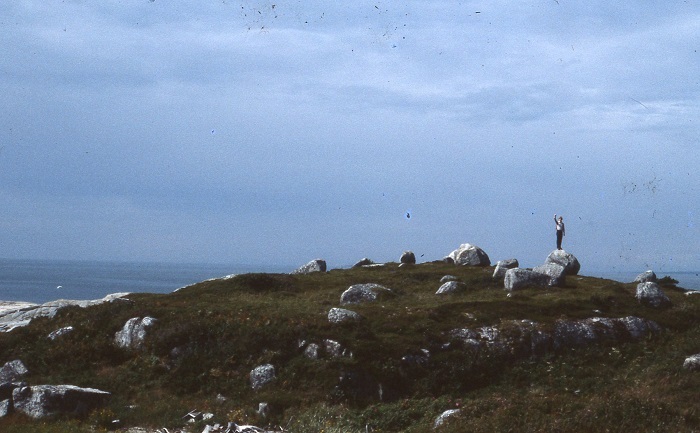 “Very funny Bob, perhaps not.” The coastline is so spectacular. Maine is very similar so we’ll see this sort of view next summer which will mark our 15th time to visit Maine aboard our own boat. 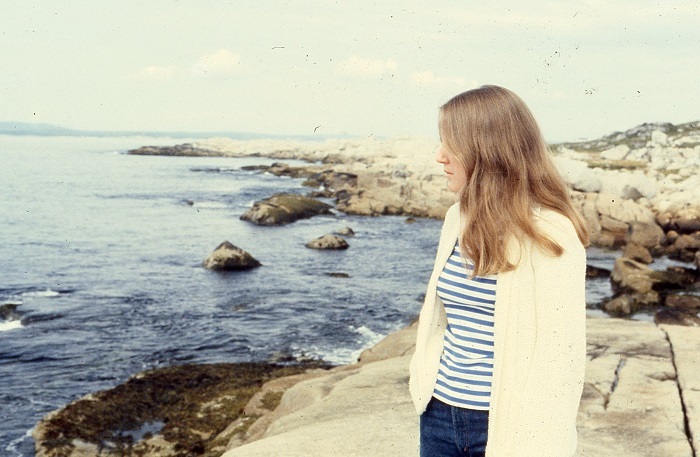 I went to Maine briefly a few years ago but Brenda hasn’t been there since I retired over six years ago. Lovely views. I wonder if it looks the same nearly 40 years later. Ok, how about a photo of me for balance? Funny, seems that I had more hair then. Well, it’s getting late and I need to pack for our trip to MD tomorrow to celebrate our grandaughter Tori’s birthday. She’s a real cutie. Perhaps I’ll close for now with a photo of my own cutie. Well, it’s been a long time since this photo was taken way back when. A lot of water has gone under our keel since this photo was taken but it’s nice to know that we will soon be making memories again in Canada this coming summer. Did I mention that we’re heading back? This time on our own boat. Who’d have guessed? It’ll be fun. Totally, for sure. 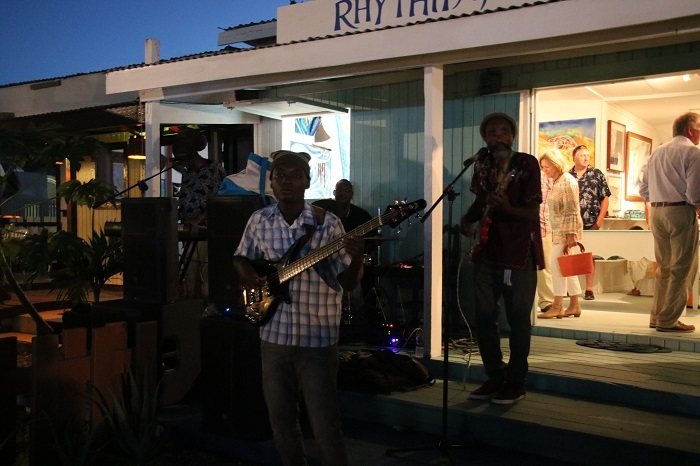 The Dawg Days of Antigua are nearly upon us. It’s Wednesday afternoon and I am here in Antigua, anxiously awaiting the arrival of the “fleet” of Dawgs heading our way. I flew in yesterday afternoon, and I am here to say that flying is a lot simpler, and faster, than getting here by boat. However, I’ll have to leave here to fly home after only a week. That’s such a bummer, let me tell you. The harbor is nearly empty with only a smattering of small boats here. 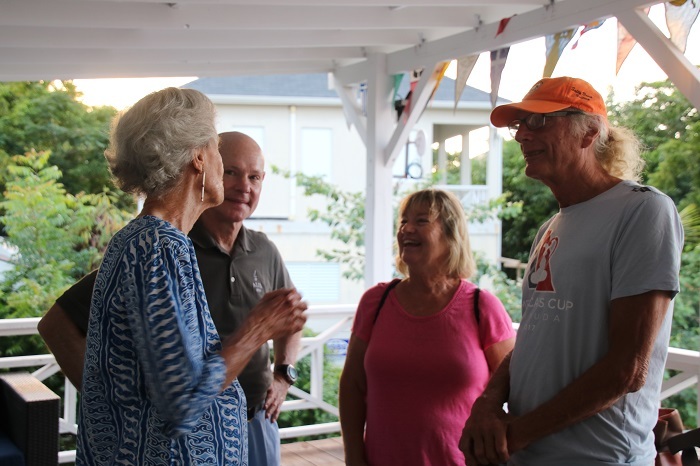 Our good friends, and live aboard couple, Bill and Maureen on Kalunamoo, arrived a few days ago from Trinidad, where they spent the summer, out of hurricane harm’s way. It’s good to see them but I am sad that our paths won’t cross again until next year, perhaps in the summer. 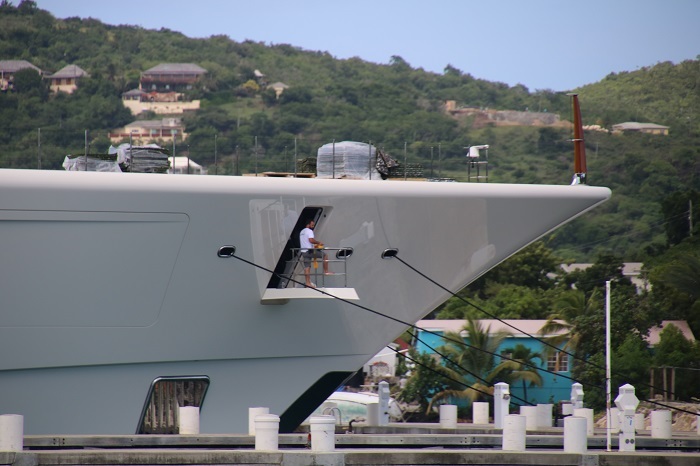 However, spars or not, there is plenty of tonnage here, made possible by Anna a 365′ behemoth, recently launched in the Netherlands, the largest yacht ever built there. 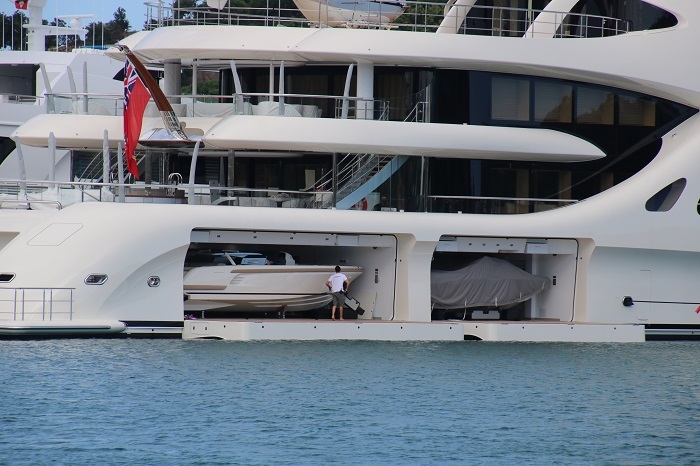 There’s only a handful of yachts in the world that are larger. 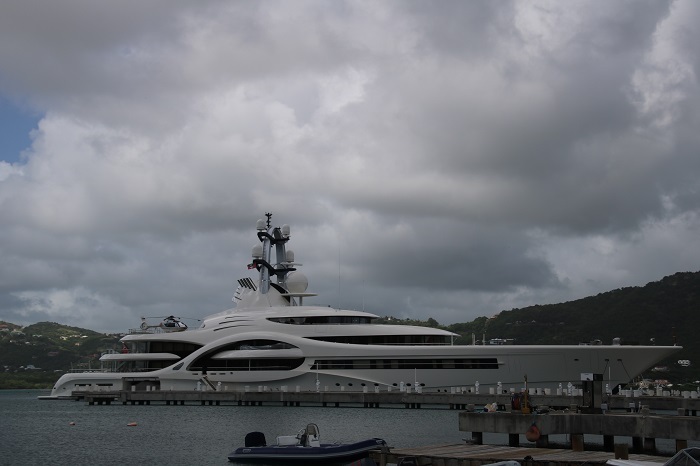 And she’s owned by, you guessed it, a Russian, Dimitri Rybololev and she cost an astounding $250m to build. That sounds like a lot but it’s really not all that much when you consider that he has an estimated worth of $7 billion. That’s 7,000 millions! What’s even more amazing is that he still has that much money after settling with his ex for a whopping $4.5 billion divorce settlement awarded to her buy a Swiss court. But don’t worry about Dimitri because the award was later reduced to a piddling $600 million after the couple settled amicably. Isn’t that sweet? Me, I’d be pretty amicable if I got $600 million. At 1/4 billion, she’s just bristling with cool stuff. Including her own chopper. 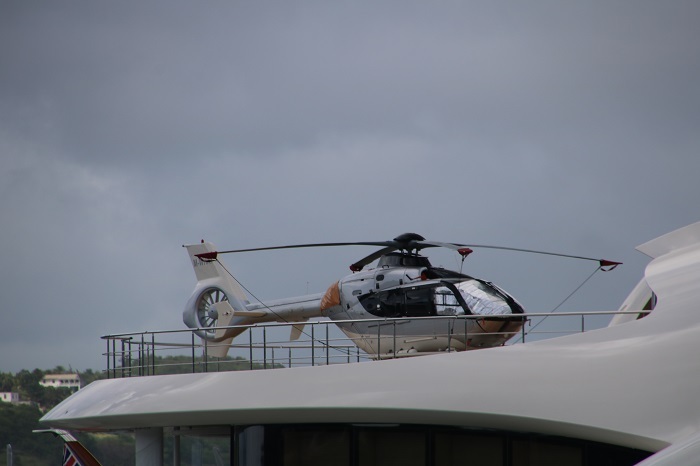 You can be pretty confident that you have plenty of funds available if you have one of these on board. Of course, having two “garages” to keep your tenders makes a pretty clear statement as well. You can really tell how big she is compared to one of the crew up forward. And, this guy is only one of 30 that work aboard full time. Quite the payroll. Need to know more in case you are thinking about having one built for yourself? Check this link to get the skinny. Dimitri is a smart guy naming his new boat after one of his daughters as she won’t be divorcing him any time soon. I expect is pretty good friends with Putin. 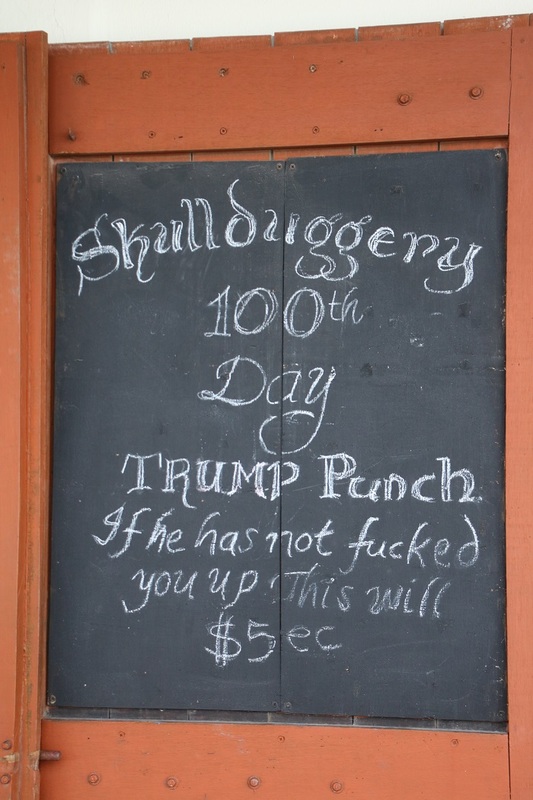 And, speaking of Putin who also seems to be pretty fond of our president, I was struck by this sign at the Skullduggery bar in Falmouth, promoting a special rum drink. At $5EC, it’s quite a deal as that’s only $2 US. Thanks Mr President. If you disagree, don’t blame me, I’m only reporting. 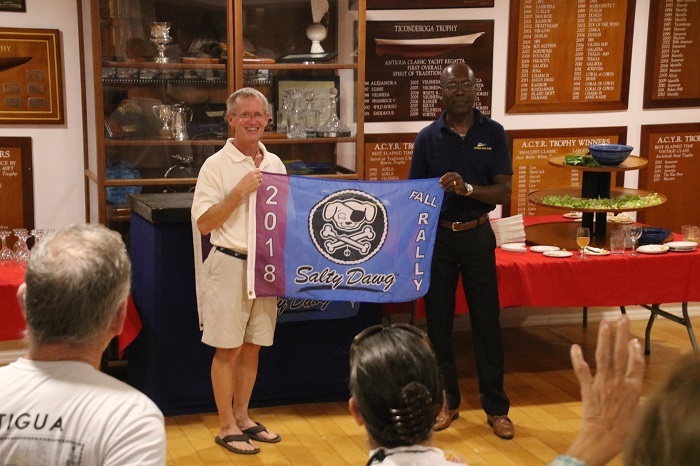 As far as the Salty Dawg Rally is concerned,and that’s why I am here in Antigua, the 40 or so boats that are headed my way, in spite of delays caused by a really bad run of adverse winds, should begin arriving over the next few days. I expect that more than a few of them will be happy to have a Trump Punch. At $2US it’s about the best deal in town. 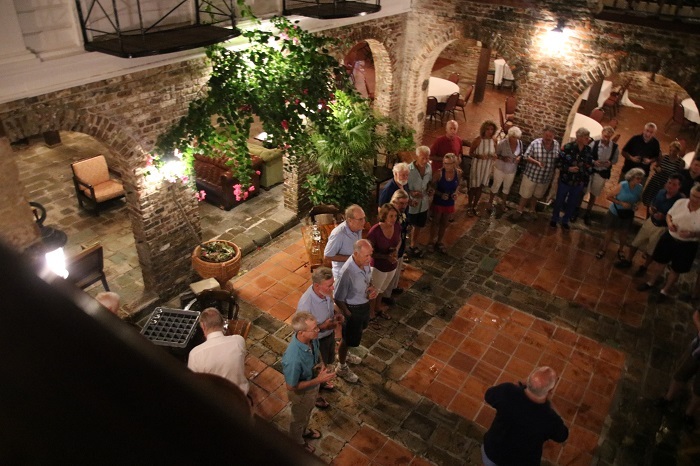 Of course, that will only be the beginning as we have plenty of fun events planned to help welcome the fleet to Antigua now through Thanksgiving. 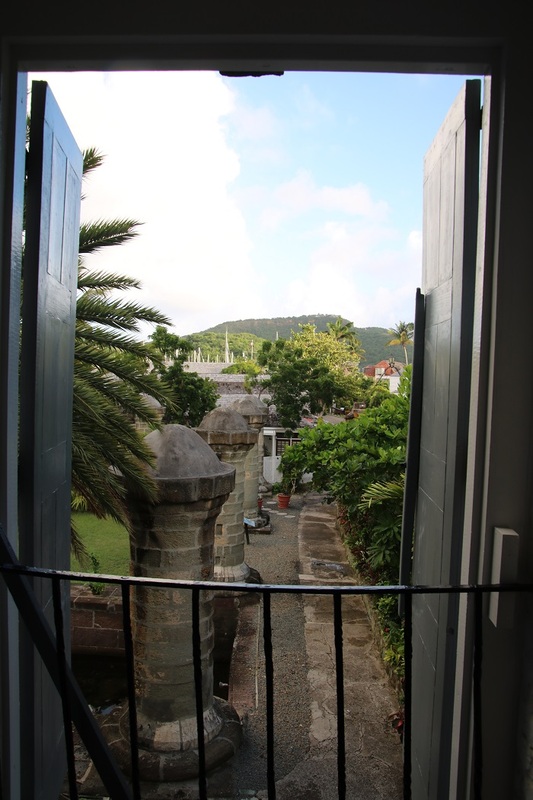 One way or the other, Antigua is about to really go to the Dawgs and I am looking forward to that too. 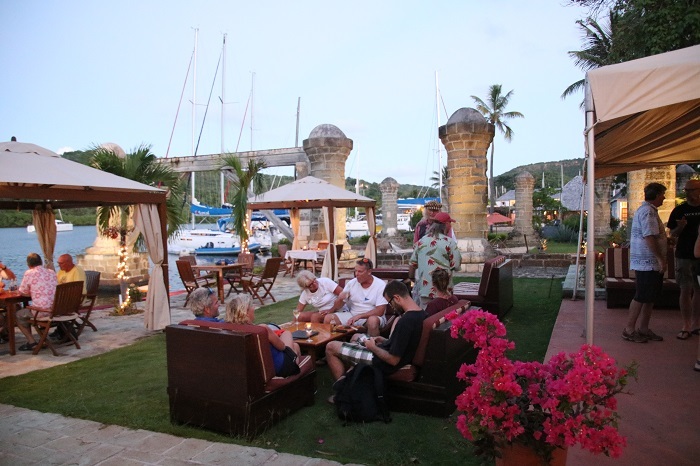 I’m off to welcome the Salty Dawg fleet to Antigua. 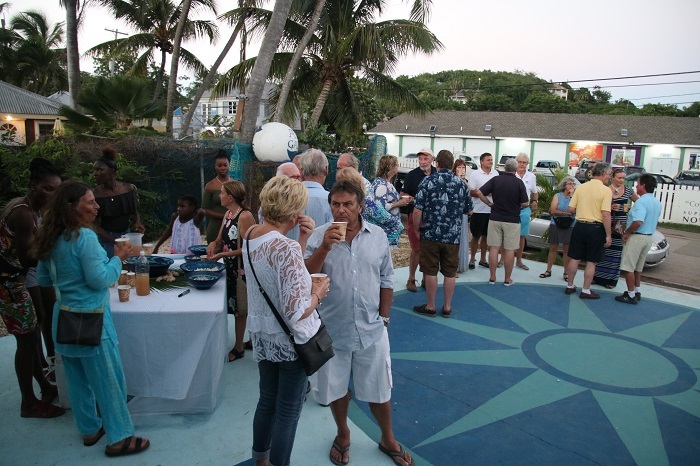 It’s Monday morning and I am heading to Antigua tomorrow to welcome the Salty Dawg Fleet to that beautiful island. That’s the good news. The bad news is that NOBODY has arrived yet and it’s still going to be a few days until the first members of the fleet will show up. The problem is that weather in the Atlantic in November is generally not all that great. As the summer SW prevailing winds begin to give way to the NW and NE winds of winter in the fall and early winter, things can be pretty unsettled. 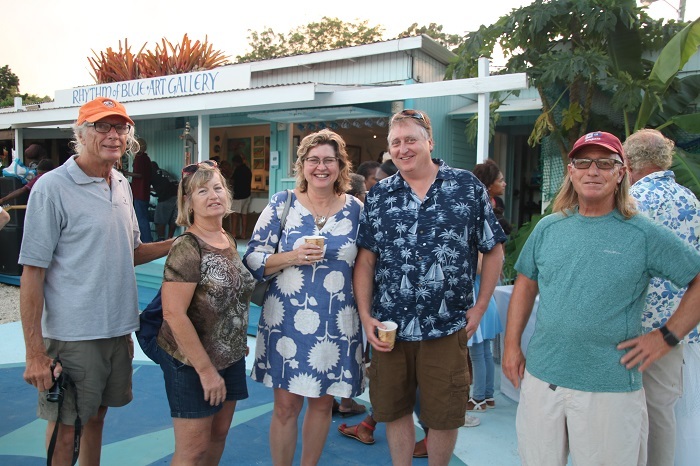 As November is toward the end of the hurricane season and when insurance companies say that it’s OK to head south, that’s when most sailors move their boats to warmer climes to enjoy the winter season of sailing in the tropics. 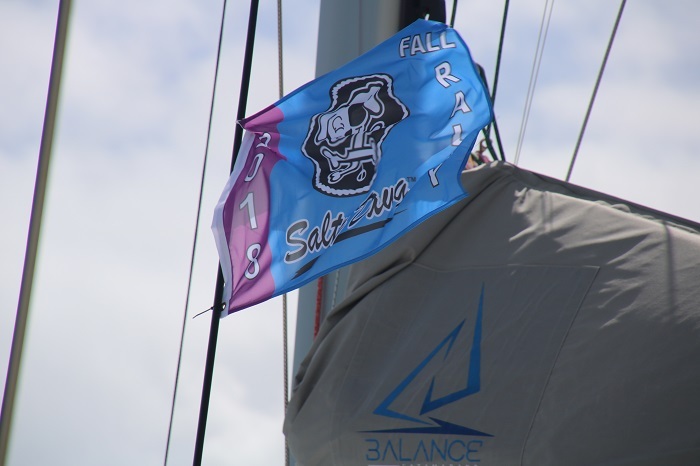 Well, this year’s Salty Dawg Rally to the Caribbean has been pretty challenging with persistent SE winds making it tough for the fleet to make their way south to Antigua or the BVIs. 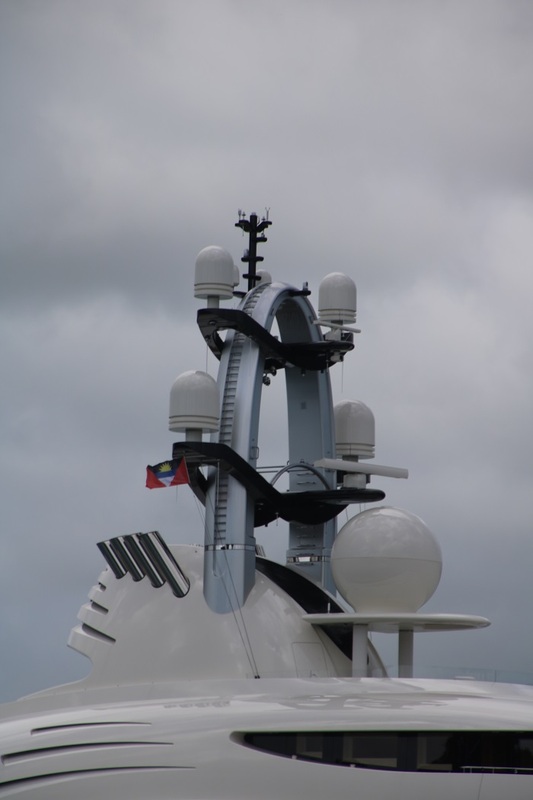 Additionally, it was a pretty rough crossing of the Gulf Stream due to strong NE winds the day before much of the fleet crossed, kicking up a pretty confused sea, and a number of boats had to stop in Bermuda to fix broken gear. 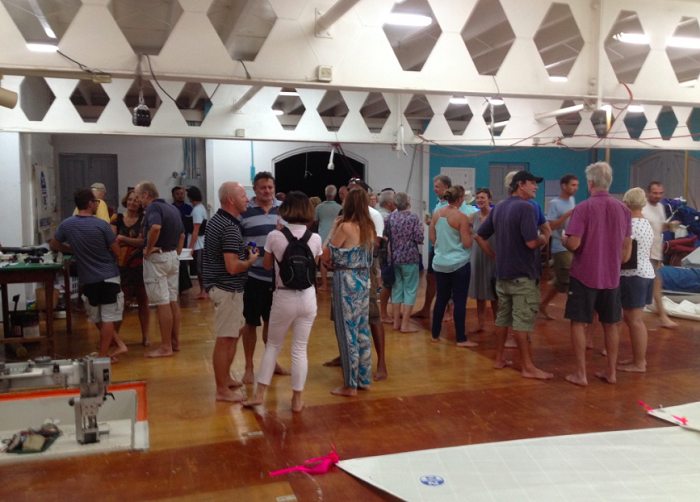 The winds after the GS were also fairly light and not from a favorable direction so many other boats had to make a stop in Bermuda as well for fuel before heading out again. Add to all of this, a low forming north of Puerto Rico that will cross the likely track of the fleet, and it gets pretty interesting. 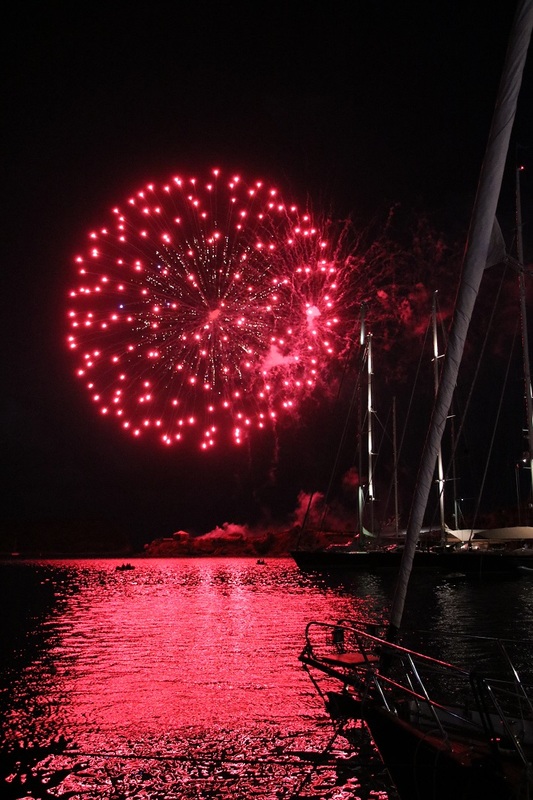 As a result of all this, the fleet is running behind and I am going to push back some of the events I have planned in Antigua to celebrate their arrival. When I scheduled the first few events a few months ago I knew that there was some risk that we’d have to move it back and as of yesterday the full impact of delays to getting the fleet there in time, became clear. 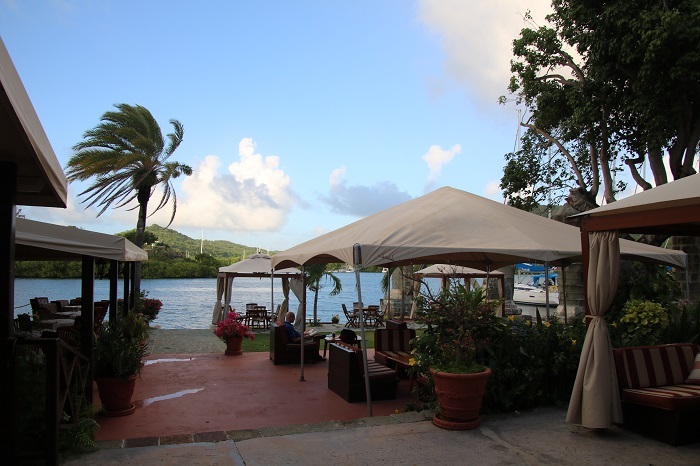 So, off to Antigua I go tomorrow to wait. 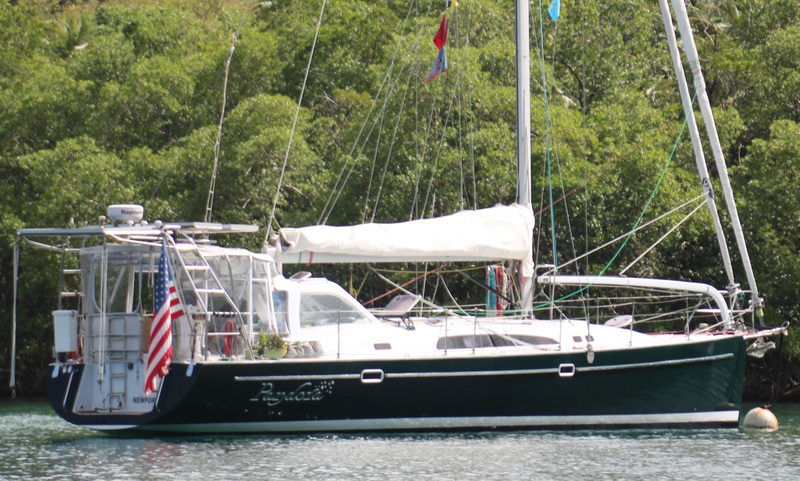 However, my friends Bill and Maureen of Kalunamoo are already there, having sailed up from Trinidad last week so it will be fun to spend time with them. My friend Craig will also be flying down on Thursday to enjoy the fun so I’ll be plenty busy. 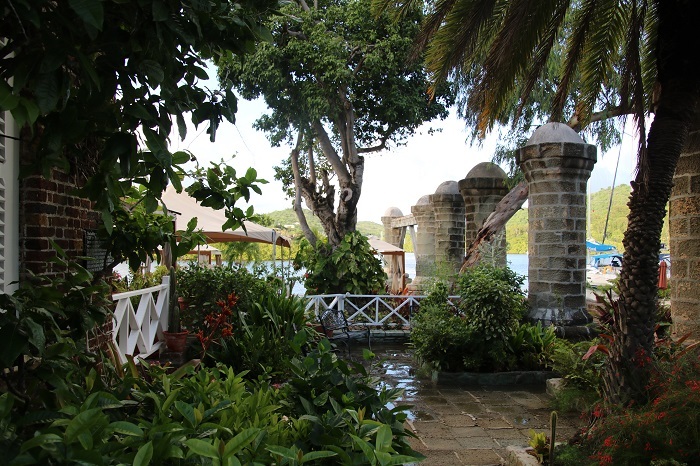 Of course, staying at the Admiral’s Inn won’t be particularly tough duty. It’s a really beautiful place. What a spot to sit and work on a nice cool G&T. No, make that a rum punch. It’s the islands Mon! 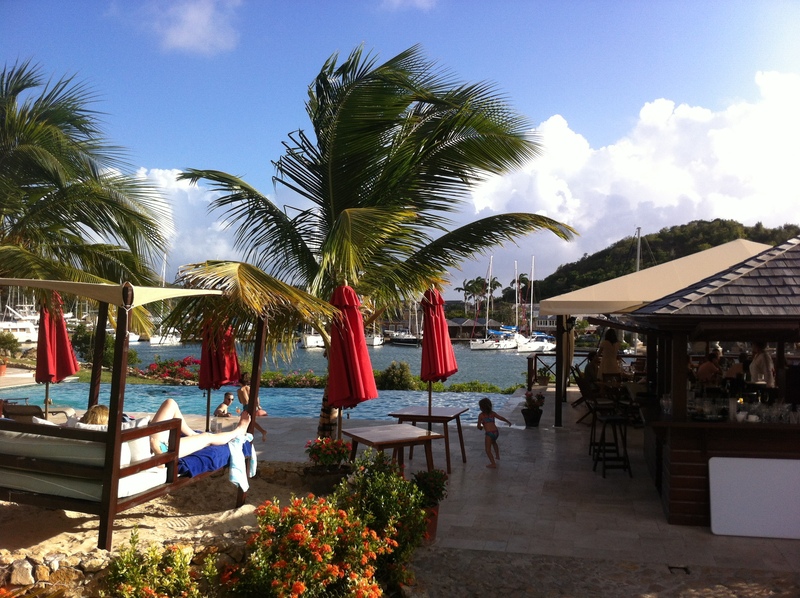 And, don’t forget about the infinity pool looking over historic Nelson’s Dockyard. Yeah, I could do that too. 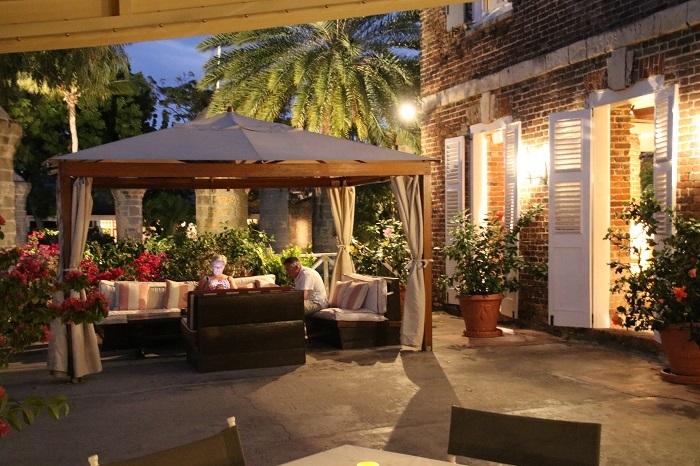 Now that I think of it, perhaps another totally excellent spot for a rum punch. And speaking of rum. 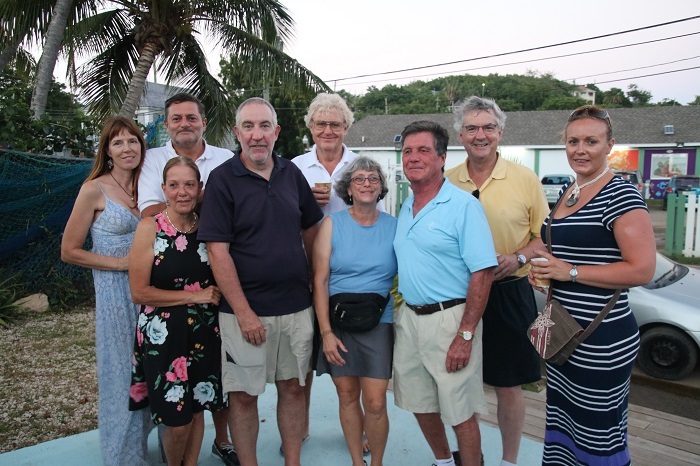 How about hanging out a bit with my friends from the Tot club, better known as the Royal Naval Tot Club of Antigua and Barbuda . As a relatively new member, there’s still lots of Royal British Navy history to explore, along with an appropriate, make that a responsible, measure of rum. I remember, well I sort of remember, becoming a member last spring and have a photo to prove it. I say “sort of remember” as some of the details are a bit fuzzy. Of course, after all of those “tots” it’s hard to be clear about anything. But, it was fun and I, sort of, learned a lot about British Naval history. That reminds me, I don’t want to forget my “official” Tot Club shirt. Anyway, I’ll make the best of this trip, one way or the other. That’s true. So, let’s hope that things continue to go fairly well for the fleet and that everyone arrives safely and without incident. If you’d like to follow the fleet’s progress, click here to see a map of the fleet as they make their way south. Put SDR in the “group” section along with the date range. The fleet began to head out on November 1st but you may find it easier to see what’s going on with a narrower date range. This is the location of the fleet as of Monday morning. 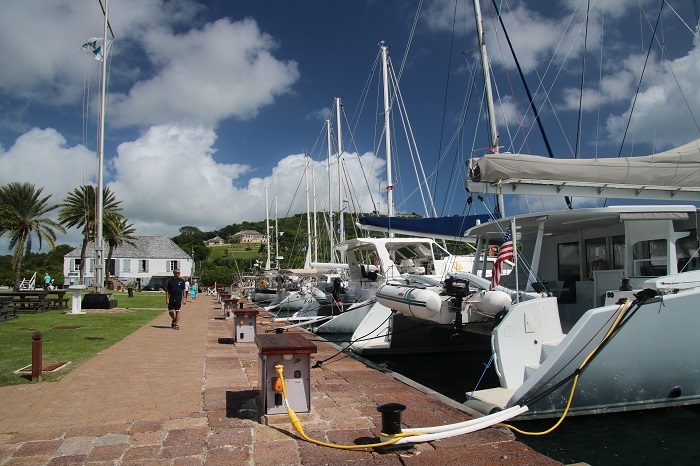 The fleet is roughly split between Antigua and the BVIs. 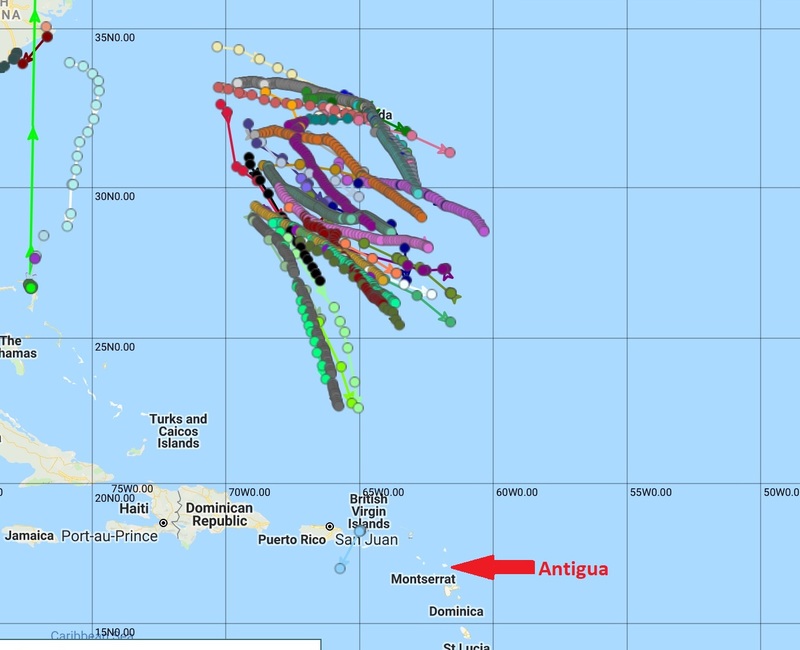 I have notated “the” destination, Antigua so you can see how much farther they have to go. 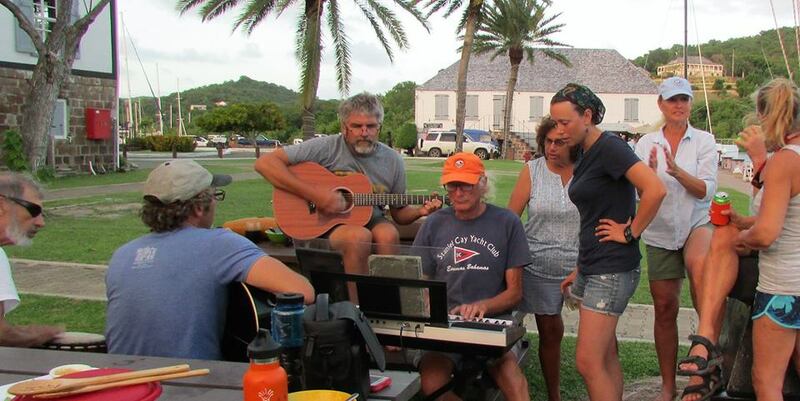 Yes, it’s a long way off but only 90 miles farther than the BVIs. Conditions may get bit rough for the fleet with the low that is going to cross their path as they get closer to the islands. It’s fast moving and while it may bring winds in excess of gale force if they get stuck in the middle of it, it’s not looking quite as organized as it was forecast to be just a day or so ago. The low is the dark blue section to the right. This screen shot is of about 06:00 EST today and is currently east of the fleet’s track. However, by Wednesday, when many boats will be at about the same latitude as the stronger winds, it is expected to cross their track. Chris Parker, the weather router for the rally, suggests slowing down to let the low pass. Good idea. As they say, when you are on the ocean in a small boat “it’s always something”. And, speaking of waves, which I sort of was, I came upon this video of the largest wave ever surfed, a 95′ monster a few years ago in Nazare Portugal. It’s huge, and yet, in this short video, predictably looks smaller than it really is, a frustrating reality for anyone that has been in heavy weather on the ocean and has tried to document the conditions to share with their friends. 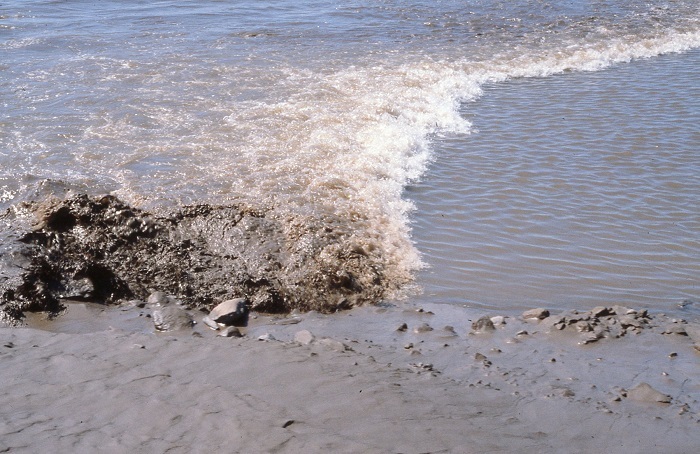 Ever wonder what those big rollers you see on the ocean look like when they reach shore? Perhaps they look like this. Ok, I said 95′ but who beyond the guys at Guinness care about such a fine detail. It’s just a frigging big wave. And wonder what it’s like to get knocked down by such a wave as it crashes down on you? No, me neither. Anyway, this short piece shows what happens when a wave, again in Nazare crashes over a surfer and jet ski. And so, you are saying that you do this for fun? Nazare, were these videos were taken, is of particular interest to me as Brenda and we were there, not by boat, a few years ago and were impressed by the size of the waves, even in the summer. 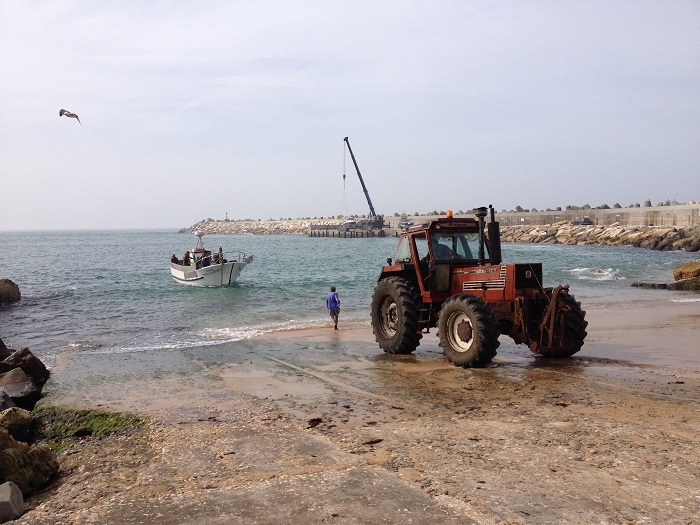 Interestingly, while there is a small well protected harbor nearby, many of the traditional boats that fish the coastal area are launched and retrieved from a ramp on the beach, pulled up by a tractor, in sync with the waves. 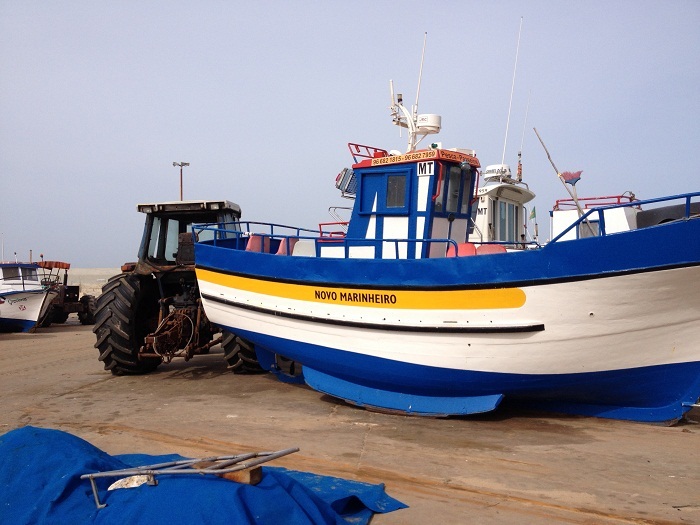 The boats have rub rails on their bilges to allow them to be dragged up by the tractor. 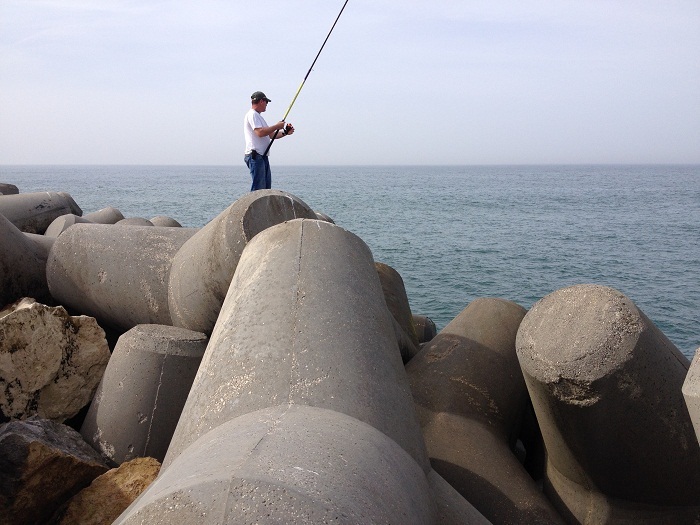 And, as the videos showed, it gets pretty “sporty” in the winter so, to keep everything from washing away the breakwater is made up of huge concrete “jacks” that are more likely to stay put when those enormous waves come pounding down on them. I wrote about this beautiful village, waves and all, in a post when Brenda and I were there. Still want more? 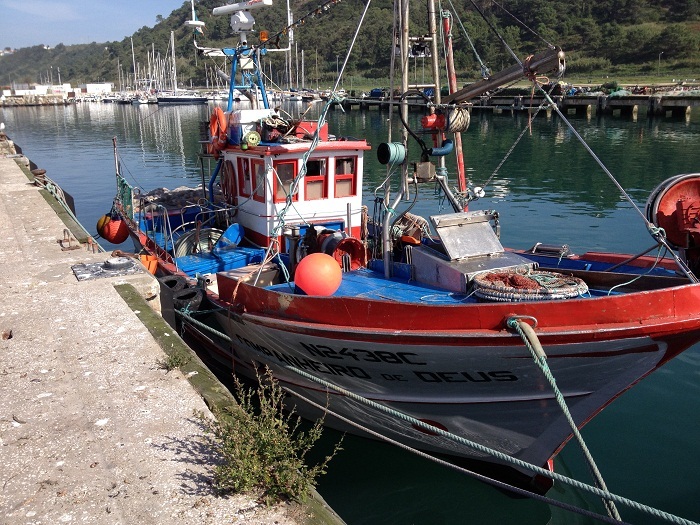 This post is mostly about the local fishing boats and what they catch. I just love boats. All sorts. 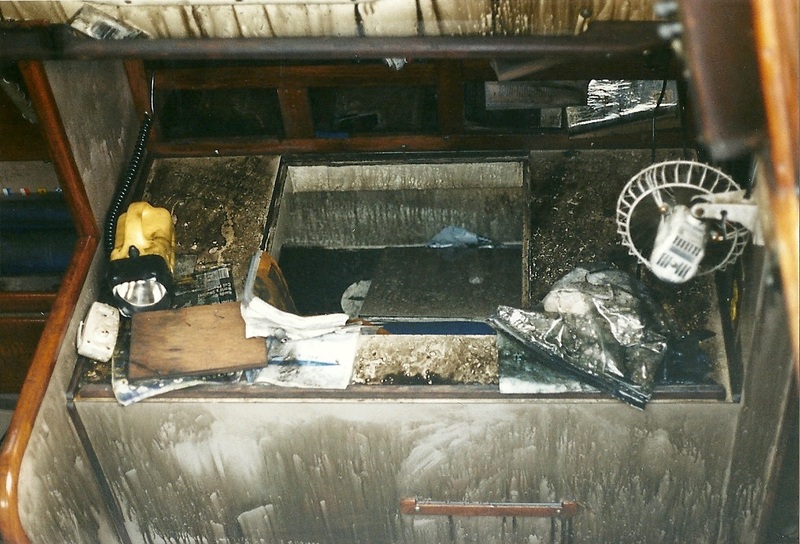 Perhaps this boat photo will tempt you to reconsider skipping my post and click on the link to read more. So, there you have it, the Salty Dawg Rally fleet making their way south, some wacko dudes surfing some of the world’s biggest waves and lovely Nazare Portugal during the “off season” when the waves aren’t all that big. Well, that’s it for now. 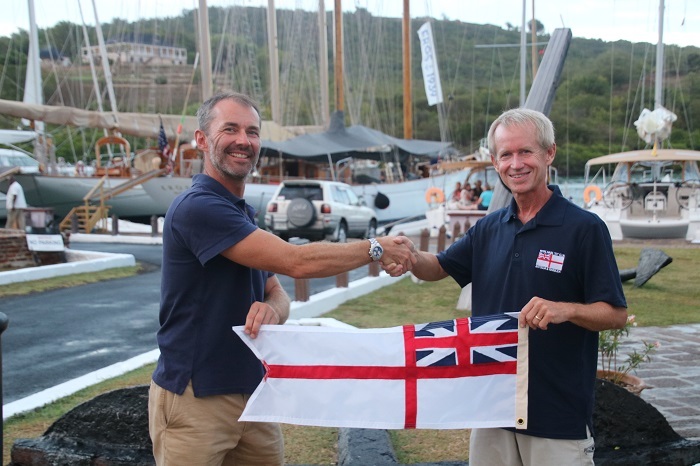 Tomorrow I’m off to Antigua to welcome the fleet, when they finally get there.